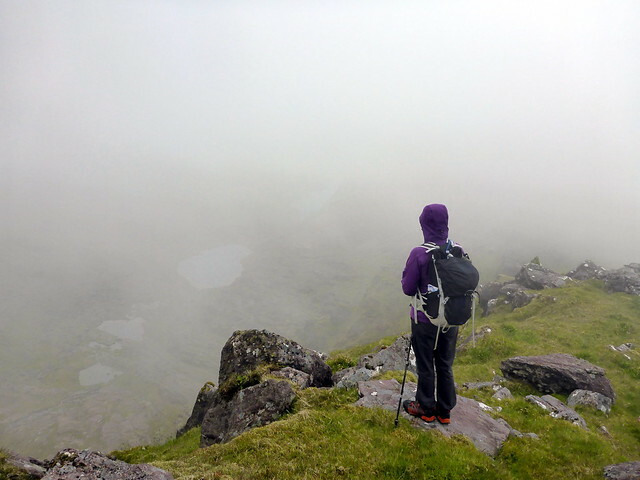 Summer Holiday 2017 - it had to be a trip to Ireland to complete the Furths (3000ft mountains). 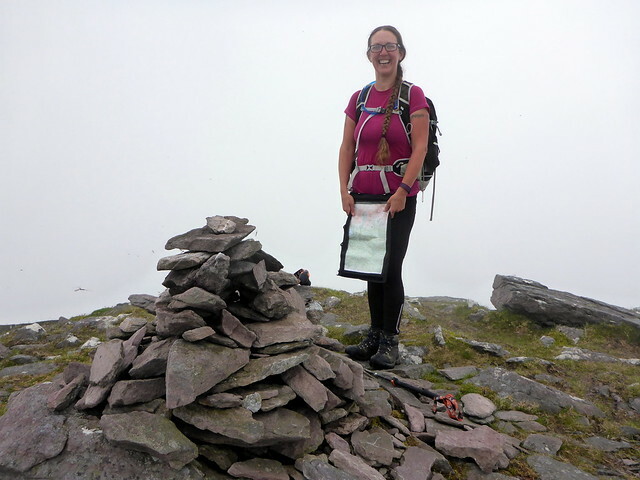 I had set my sights on the "six columns" on the SMC site (Munros, Munro Tops, Furths, Corbetts, Grahams & Donalds) a while back, with the aim of achieving them within a 5 year period. 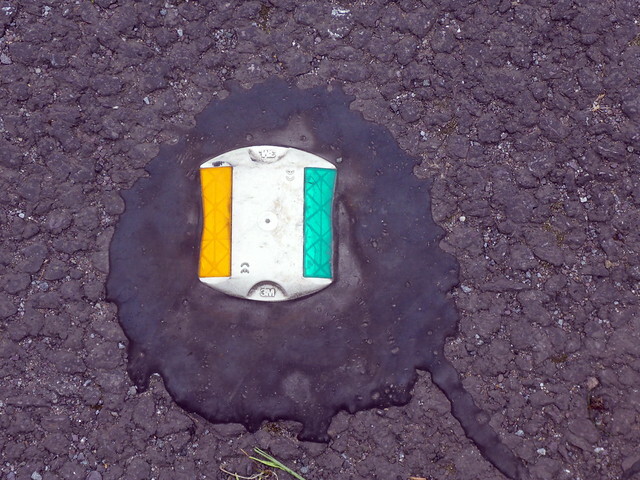 Only the 13 Irish Furths now stood between me and that goal. However there was a bit of logistics to consider. 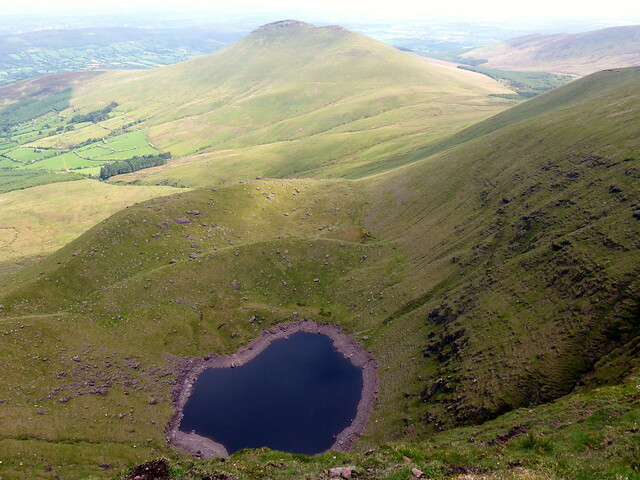 The Irish Furths are concentrated in McGillycuddy's Reeks where 10 out of the 13 live, but there's one south of Dublin, one near Tipperary and one right on the southwest coast. I reckoned that a week should be long enough to manage them and the travel, leaving a "spare" day in case of hitting problems/ weather etc. 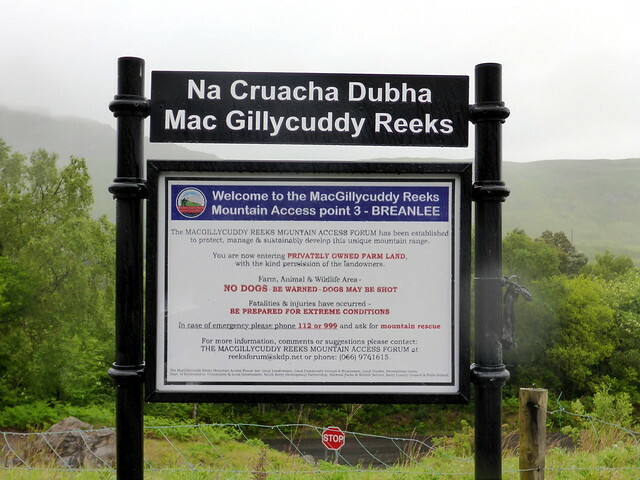 Getting good quality information on routes etc is a bit difficult (there are probably good Irish mountain sites but the ones I found were not of the standard of Walkhighlands - I've become a bit spoiled by the quality available here. 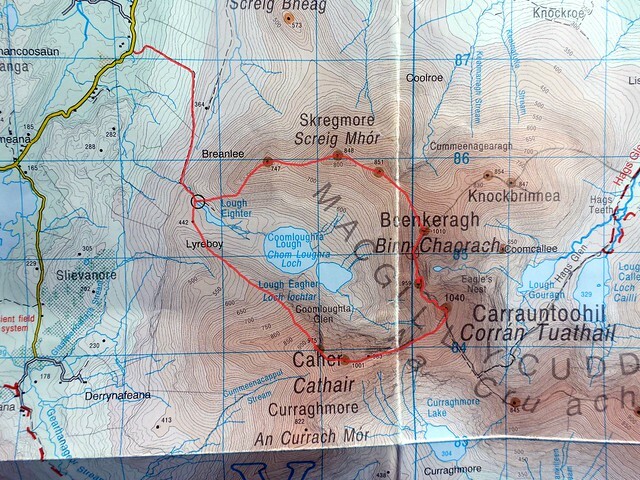 Also I didn't have a GPS planner to use to make my own routes (WH one doesn't work for Ireland). 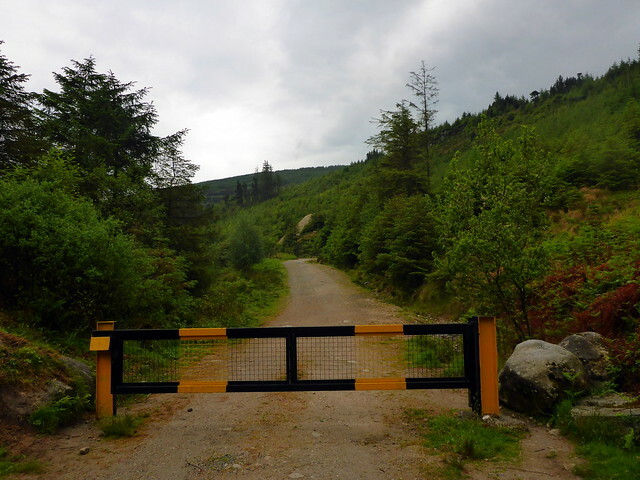 I had bought the 4 Irish OSi maps (1:50000) that I'd need but lacking the local knowledge made using them not altogether straightforward - there's no "right to roam" in Ireland as there is here, so putting together a feasible route on the map might not be practicable to follow on the ground. And then where to stay...I found a campsite near each of the hill groups and hoped that would work out alright. Getting there - originally we had the idea of sailing from Liverpool to Dublin until we found out that crossing takes 8 hours...so Cairnryan/Larne it was. An expensive outing, with return tickets for us and the car coming to almost £350 - you really notice the difference with Scottish ferries and their RET prices nowadays. We selected a morning sailing on the Friday morning, returning in the afternoon of the following Friday. 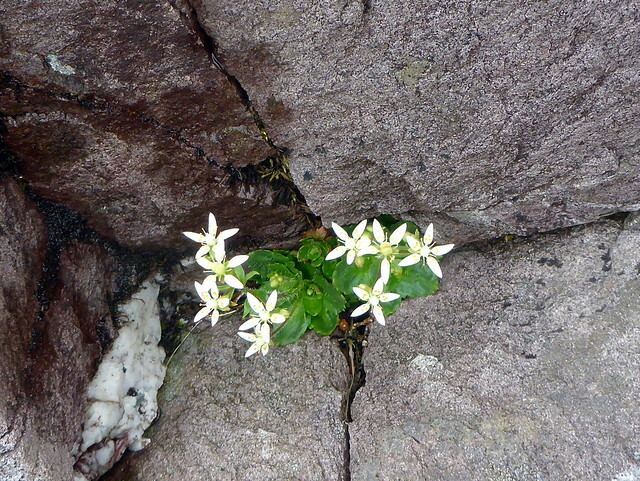 It was a sunny day on the Friday when we set out. 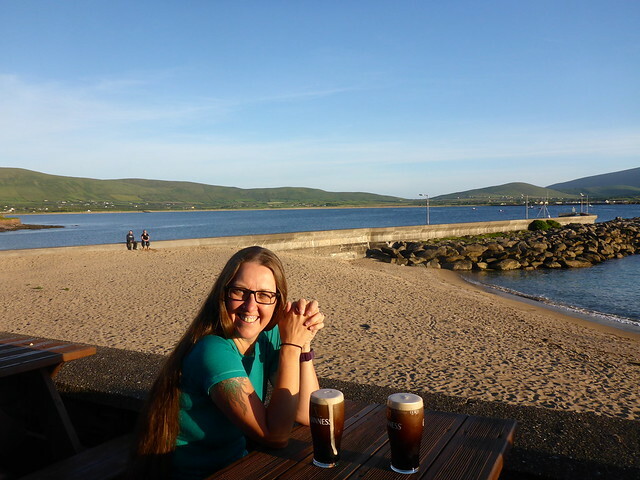 I picked Allison up at 6.30 and we drove down to Cairnryan, arriving pretty early at the terminal, but better there than late. We sat in the sun until it was time to board. There were a large number of Koreans travelling. We sat in the lounge and watched the water pass us by. Allison went off to the toilet and seemed to be taking forever. When she finally returned she spoke of how there was a queue for the ladies and the (Korean) lady at the front of the queue "hadn't seen anyone come out" of the cubicles. So everyone stood and waited, til finally it became apparent that the reason no-one had come out was that no-one was in the cubicles and everyone had been standing in the queue for no reason. 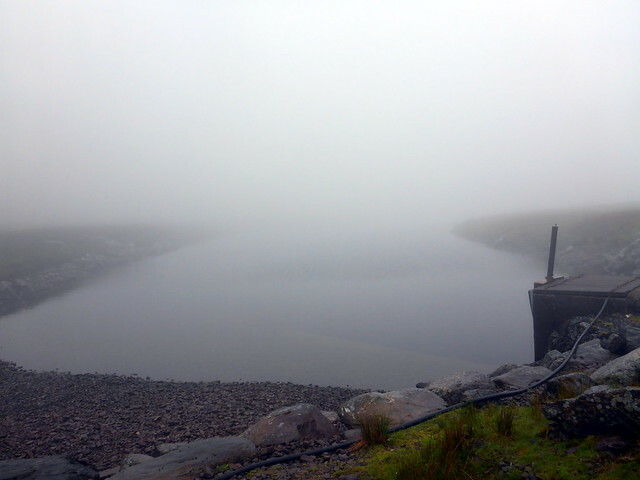 We docked around 12.30 and drove off into the unknown. 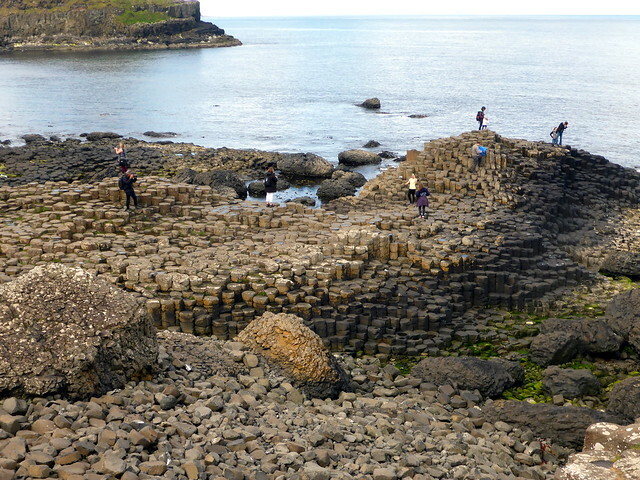 Getting around Belfast was a bit of a bother but then were on the A1 which became the N1 when it crossed the border, the colour of the road signs changed, distances became kilometres and Gaelic names appeared on the roadsigns. 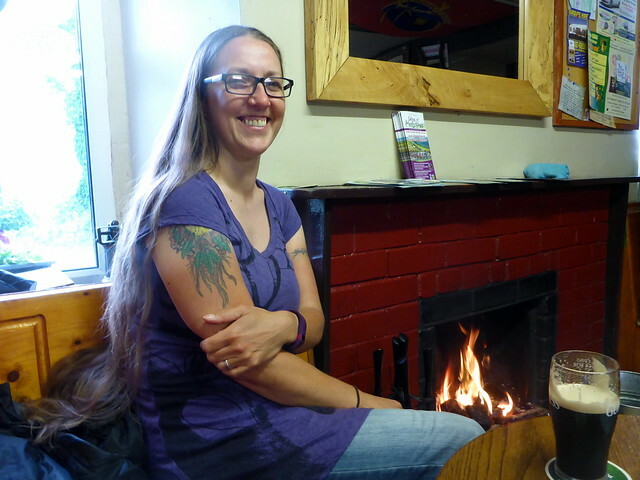 Allison had requested Irish music on the stereo whilst we were abroad, so it was a motley collection of folk and other stuff that accompanied us on our travels. We encountered the first toll, which was a princely 1.90 Euro then stopped north of Dublin to refuel (in case there were no petrol stations in the sticks - I really needn't have worried about that). Diesel is around 10 cents / litre cheaper than regular, in contrast to back home. Onwards skirting around Dublin and down to Wicklow National Park, trying to work out what county the different letters on Irish registration plates stood for. 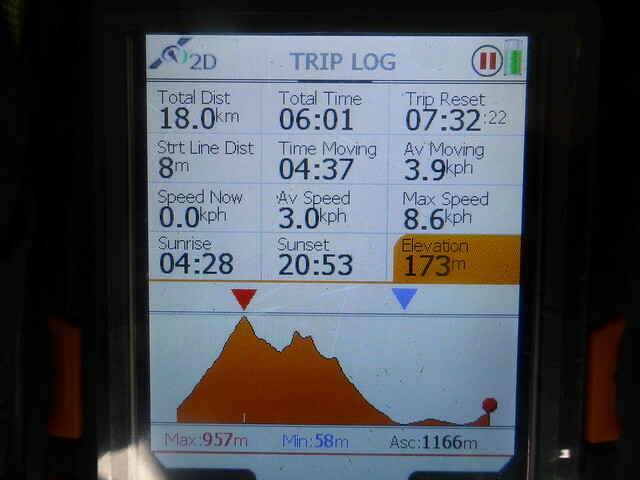 We arrived at the parking spot at Baravore around 4.45pm - really hot and sunny still. We cast around for a place to pitch and found an ideal spot across the river and in to the right - obviously in regular use for wild camping. 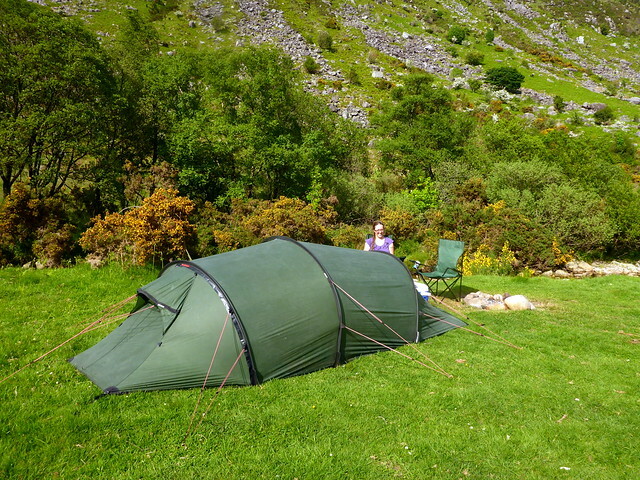 We pitched, had our tea and sat by the river enjoying the evening sunshine until the midges became annoying. By this time other cars had arrived and a number of other tents were being set up- I realised that this was a well known spot and far from having the quiet night we'd hoped for, were kept up til all hours by loud music, an acapello version of "If I could turn back time" and various howling at the moon that went between different groups. I reckon they were all enjoying a little too much ketamine. Tired and sleep starved we crawled out of bed at 7am. Forecast for the day was heavy rain and we were pleased to see it still dry. 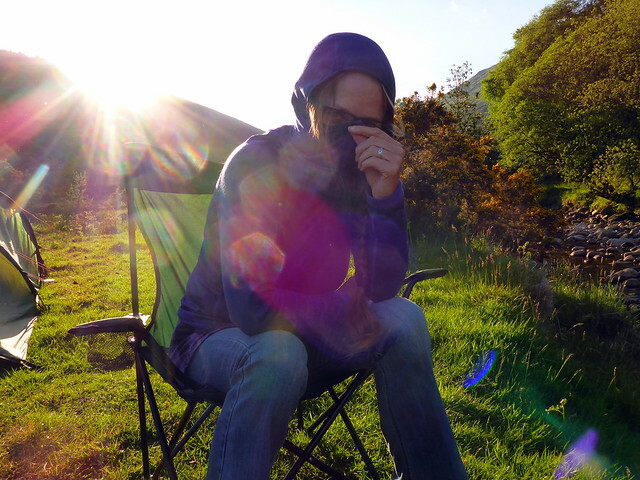 Very still, so the midges were murder taking the tent down. 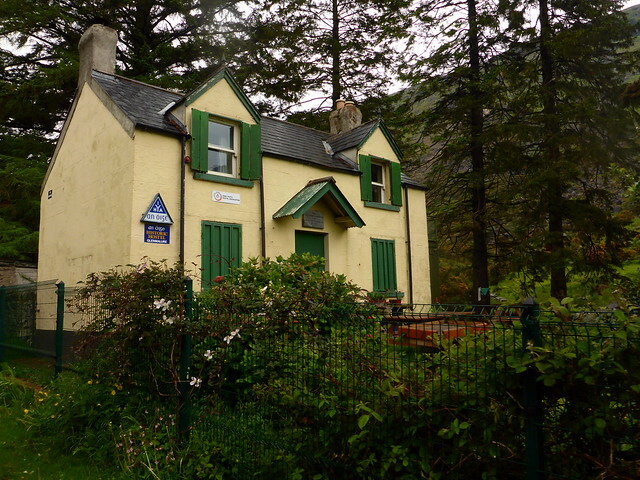 We returned the car to the main parking area and set off past the Youth Hostel up left into the forest, following a tarmac track. 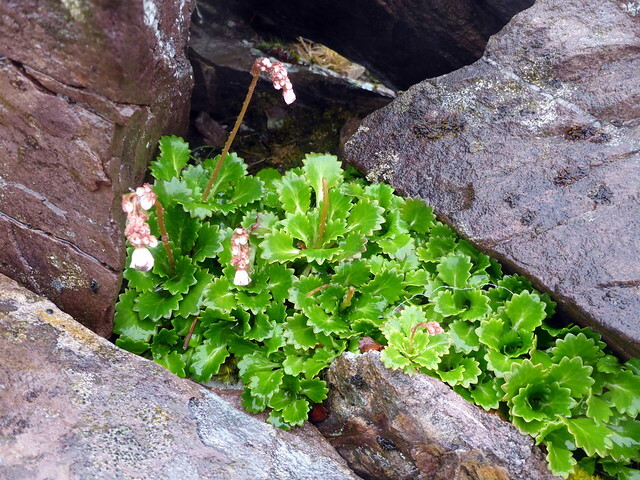 We headed up Fraughn Rock Glen, which I guessed was the name of the imposing cliff to our west. Not really sure where we were going we continued up to the waterfall at the top of the glen and followed a faint path up a steepish slope to arrive at a boggy plateau. 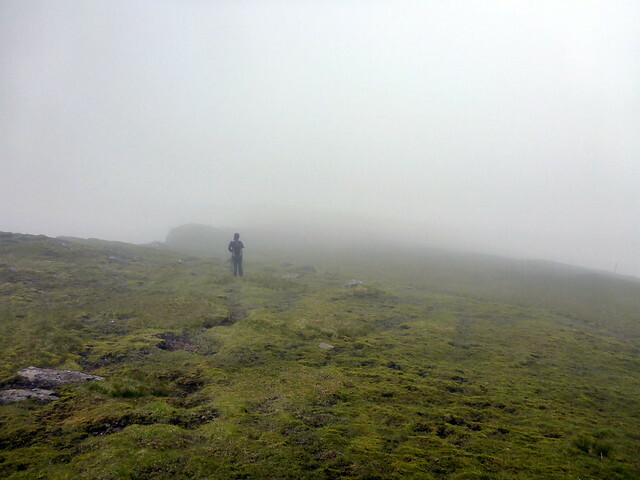 We could see the rather unimpressive hill ahead of us, with a hollow in the middle and set off up the righthand shoulder. 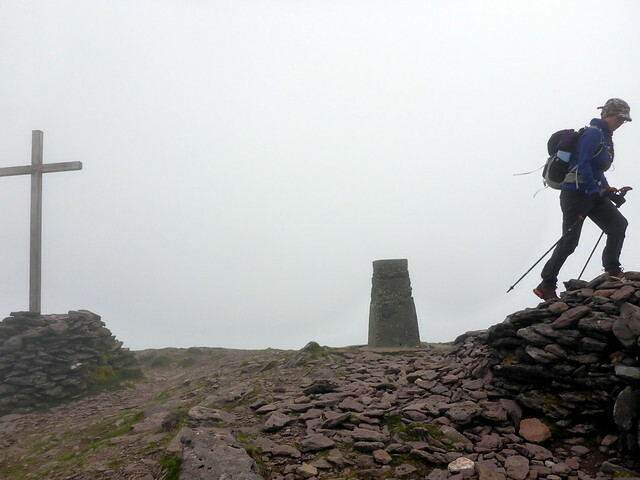 As we gained height the clag started to sweep in from the west and it was in mist that we got ourselves to the summit with cairn and trig point. 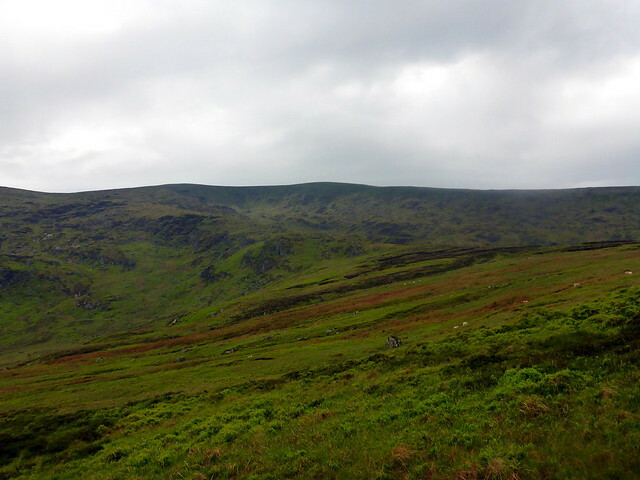 I had written down a route that took us down the eastern shoulder and dropped past Arts Lough back to the car. 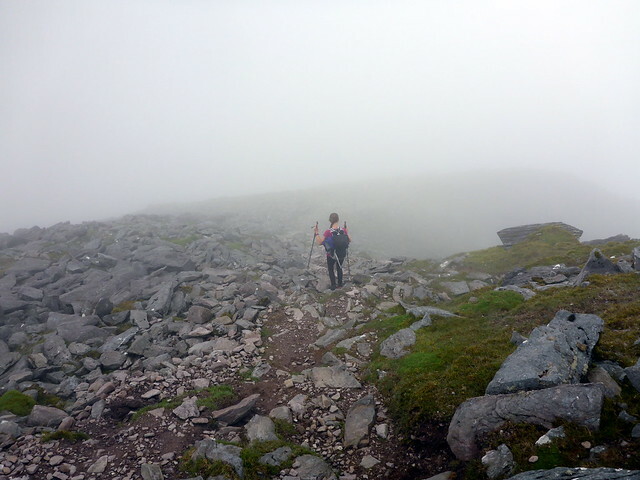 We decided, given the conditions, that we'd just follow our ascent route. 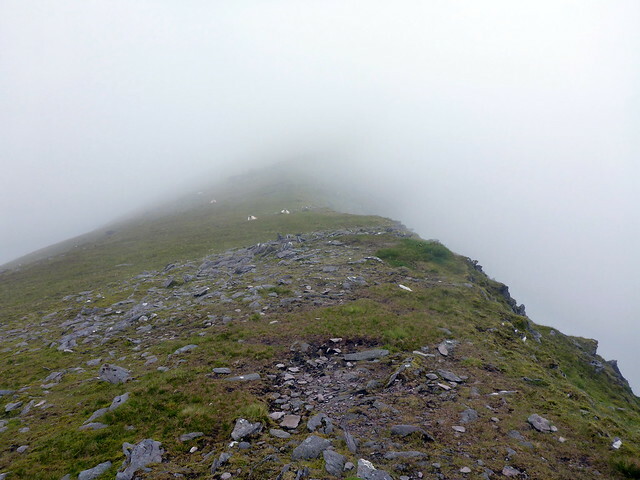 We met 3 ladies near the top - all Irish and keen walkers, had a bit of a gab with them. By this time the rain had started. We had been following a clear path and discovered that we were heading along the east shoulder rather than back the way we'd come. This was the original intention, so we just continued. 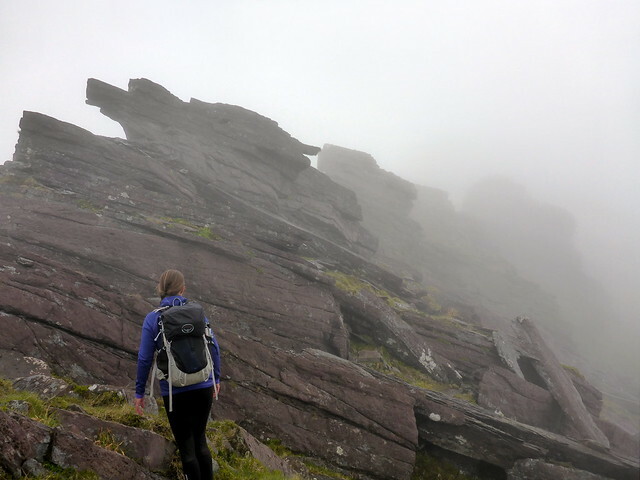 And managed to get off course in the fog and found ourselves heading up Corrigasleggaun - which was a Simm, so we claimed it before retracing our steps to the eastern shoulder and going over Clohernagh. 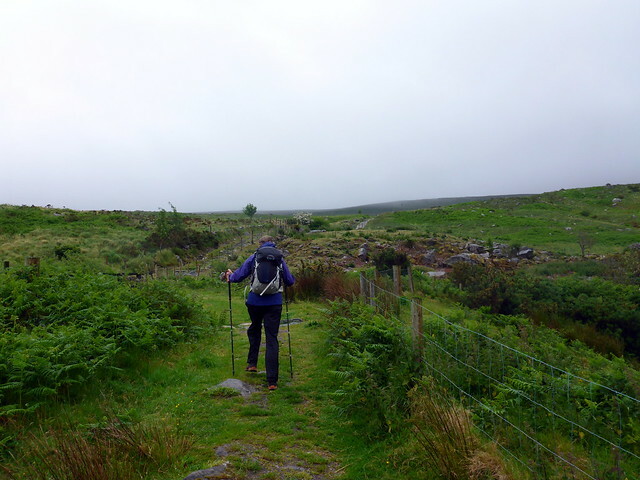 Once again I made a navigational error, missing the turn off NW for Arts Lough and instead continuing on the well trodden path to the Glenmalure zigzags - not a problem other than it extended our outing by quite a few kilometres in the pouring rain. Eventually back at the car, soaked through and chilled. Great start. 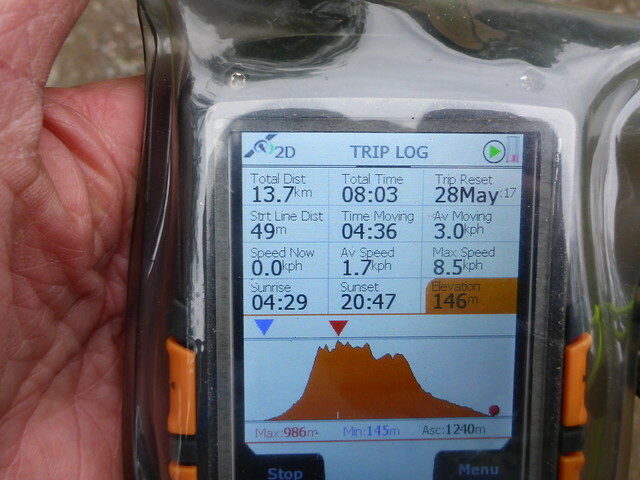 I was concerned about my navigational follies - because of the GPS issue I had no pre-planned route to follow, nor an OS map on the machine to look at (I could have bought an Irish base-map for the device). 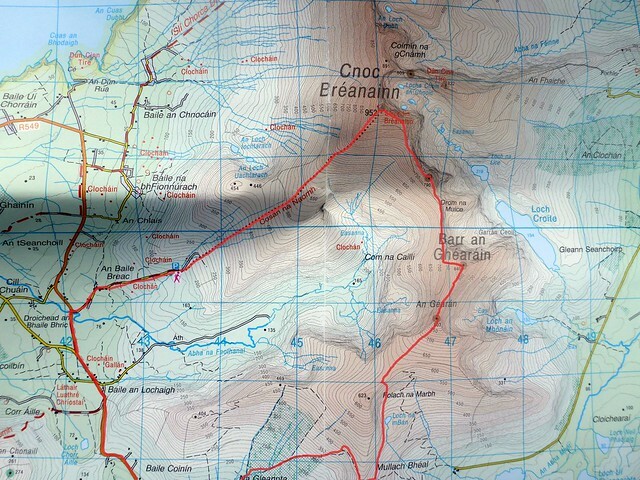 Instead we had to use grid refs on the OSi map, something neither of us have been much in the habit of, and compass. 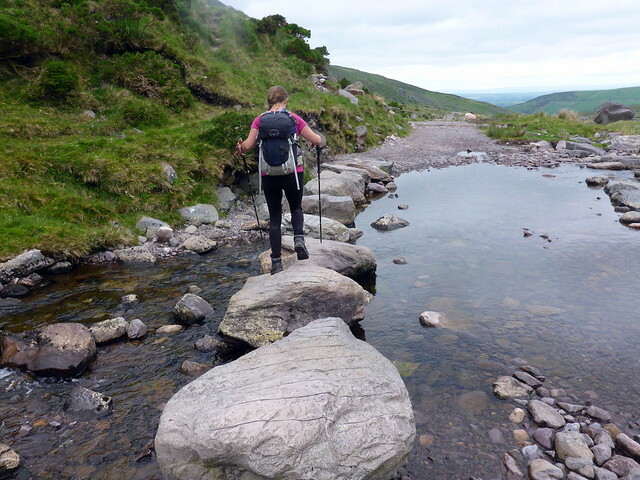 Whilst it made little difference today (other than being wetter than we might have been) it would be an issue in the Reeks where navigation would be much more critical. Back at the car we changed and tried to dry off a bit, setting off for Aherlow. 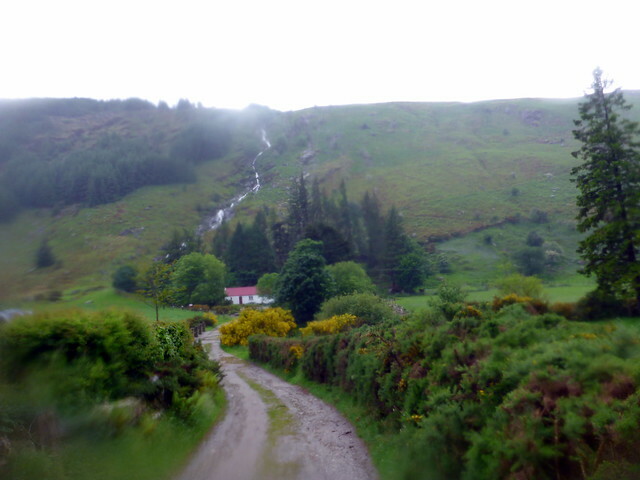 We drove up over the Gap of Wicklow, which I'm sure is spectacular but was lost in thick mist. 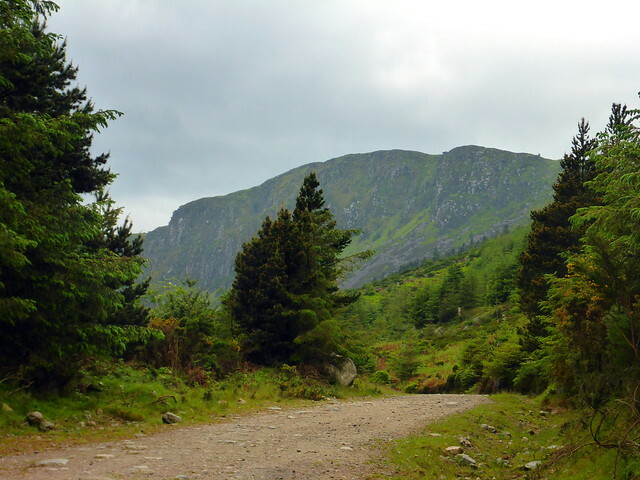 Onto better roads towards Carlow thence towards Tipperary and a beautiful scenic glen. 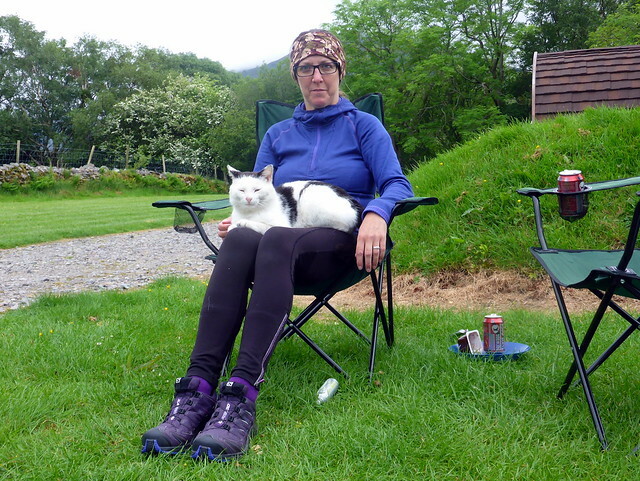 After about 2.5 hours we found ourselves at the campsite- a lovely, well tended park with a jolly man on reception. 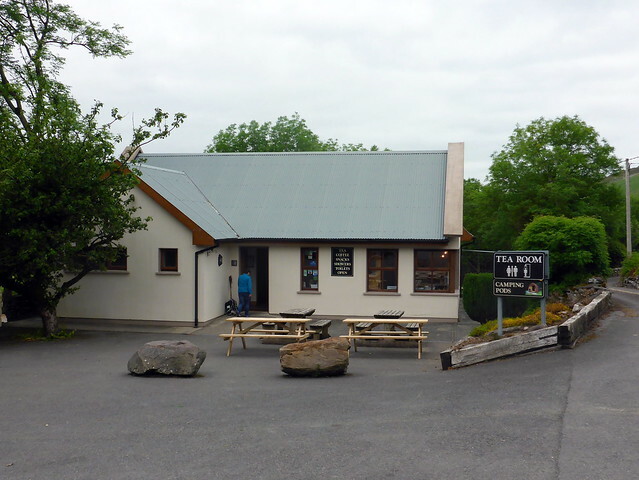 Good choice of pitches, good showers and only 300m to the nearby pub where we enjoyed a couple of pints of the black stuff by the fire in the evening. Everyone greeted those arriving and leaving which seemed odd, but friendly. Up at 7 again, packed up and ready to go by 8. 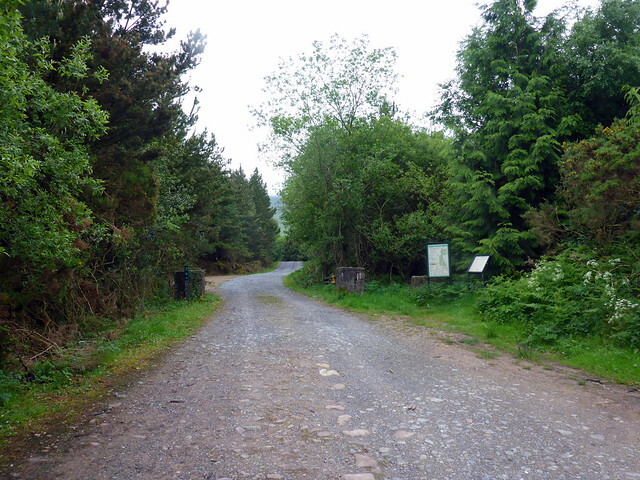 Not a great distance to drive - the start of the walk was only a couple miles away at Clydagh Bridge. We found a parking spot for about 10 cars (already half filled up) just off the main road and got ready to set out. I had drawn a route out following some instructions online and ended up mired again - the route says take a right at the T junction and go through the woods - well this takes you to an abandoned house with a huge pile of empty tin cans outside and no obvious way beyond. What you should do it take a right at the second T junction and follow the signs for Lough Curra which lead you through trees then a sharp right turn over a stile and out onto open hillside. 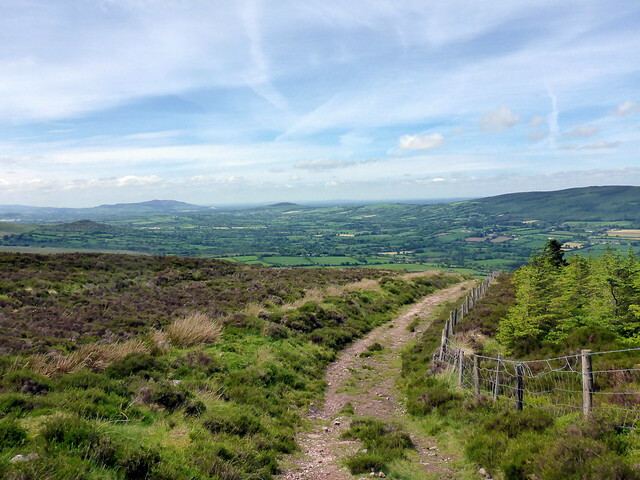 We could see the sloping shoulder of Slievecushnabinnia ahead of us - about halfway up there's a spilt in the path with the left fork heading for the lough- but continue up the shoulder. 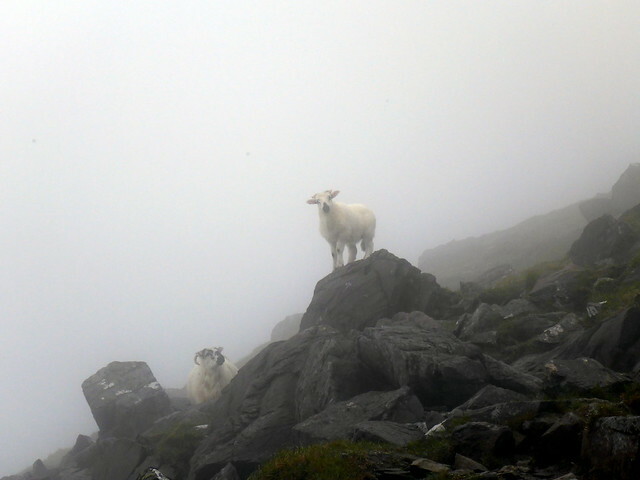 Here wwe met a couple of lads who were just completing the circuit in the opposite direction - they lived locally and climbed Galtymore twice a week. 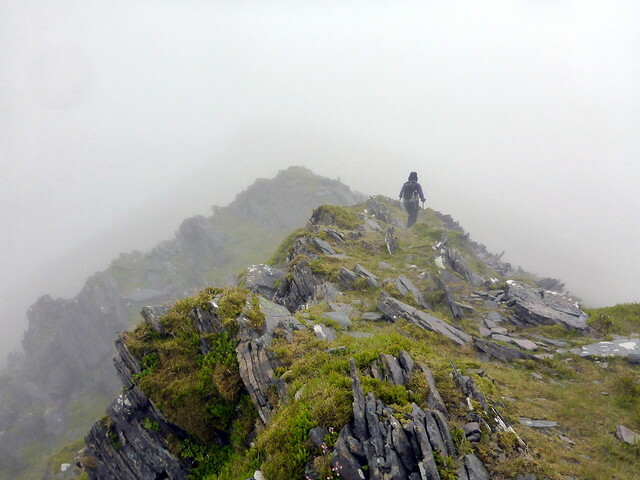 One was particularly animated and seemed amazed we had climbed hills in Scotland and Wales (CMd arete, Crib Goch). 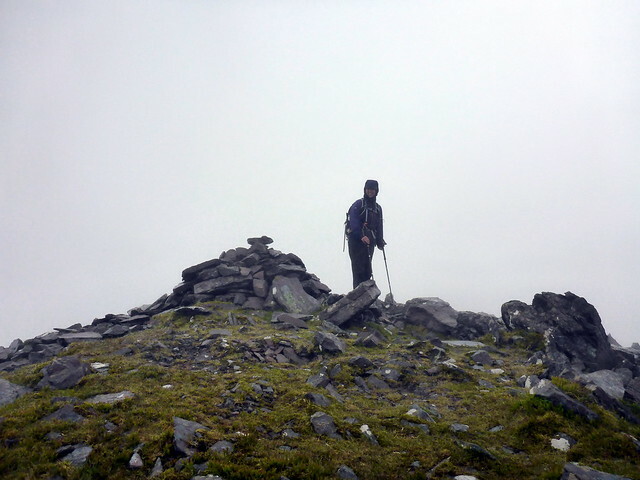 We reached the cairn at the top of Slievecushnabinnia in clag. Not another day like yesterday please? 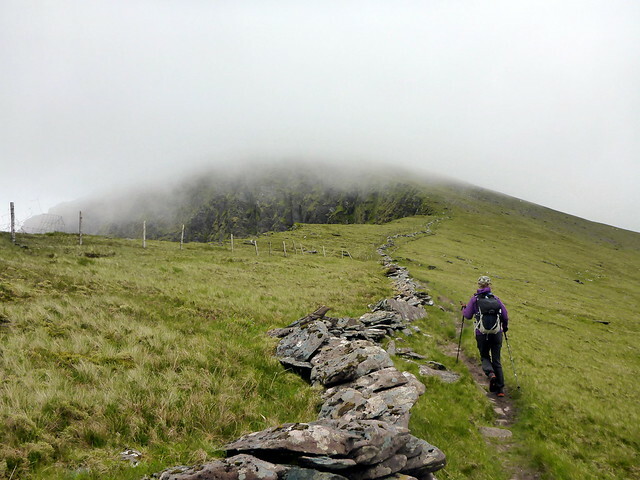 We followed an old wall onto the shoulder of Galtymore, relieved that the clag seemed to be lifting. 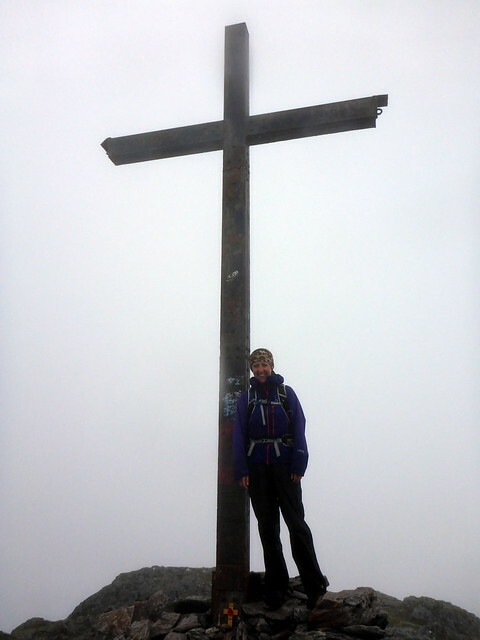 Up to the summit, decorated with a metal cross painted white. 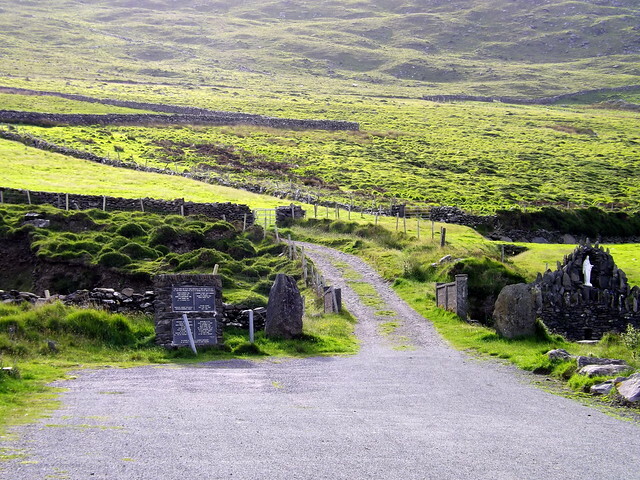 There were a number of folk coming the opposite way - without exception they were all Irish. 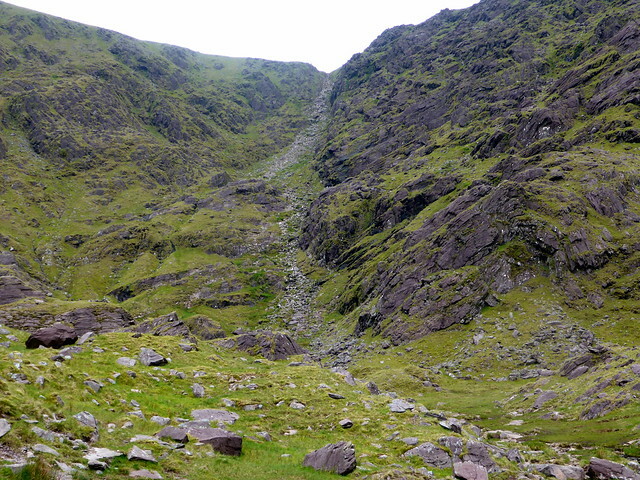 Dropping down to Galtybeg, we spotted another path used to climb these hills from the south - looked tedious. 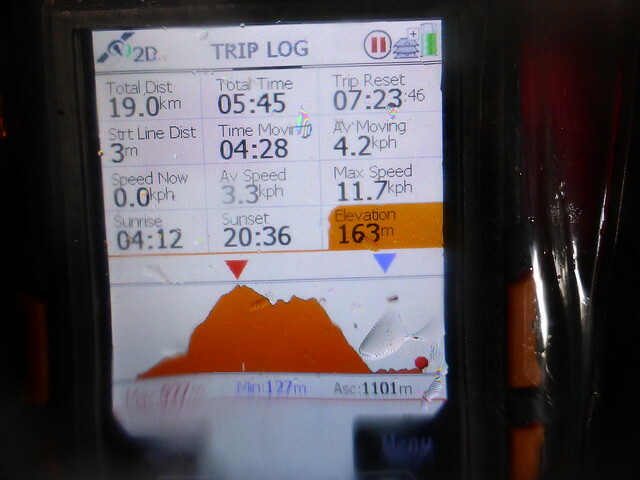 Our route was fine though, grand views out over the very flat, very green surrounding land. 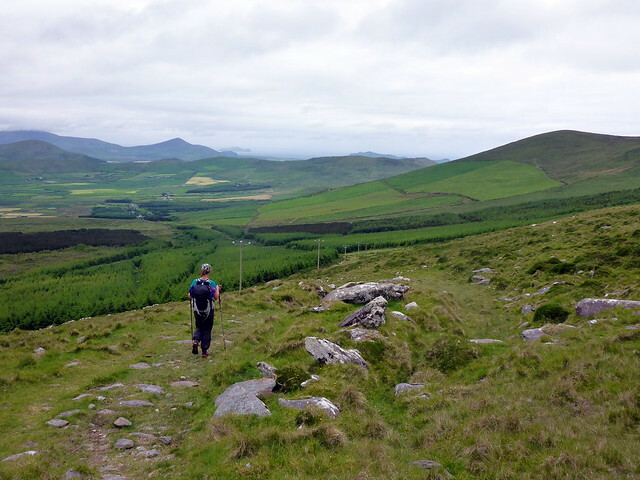 Descending quite steeply off Galtybeg we continued on to Cush, a clear path taking you to the summit over some boggy ground at the col. Hey - a bonus Irish Marilyn! 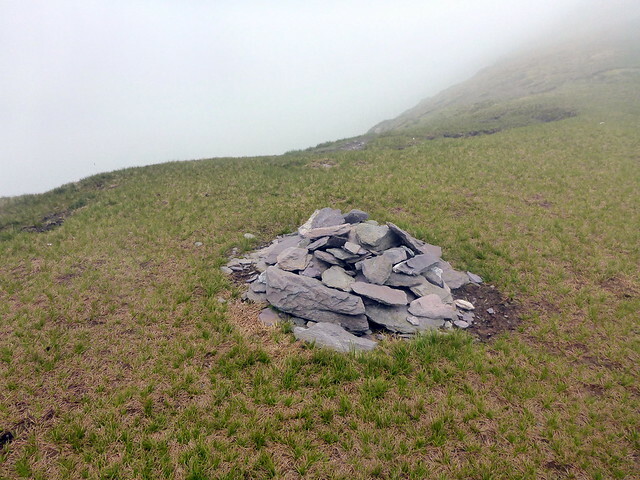 And there's a visitor book in a metal box at the summit. There's a clear path to follow back to the car park - so no getting lost today - always a bonus. 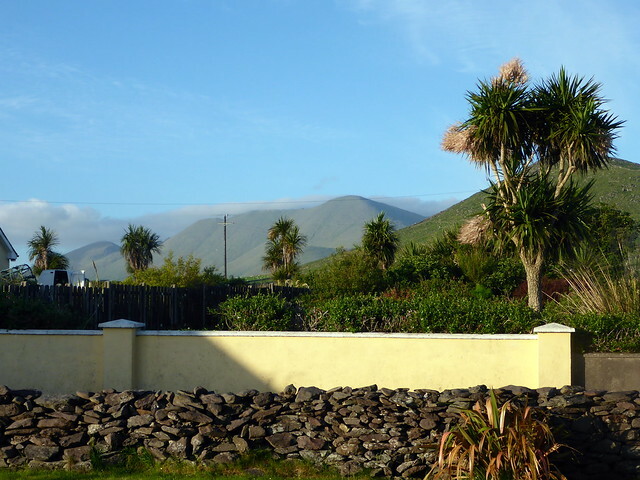 We set off for Cronin's Yard in Kerry where we intended to spend the next 2 days. 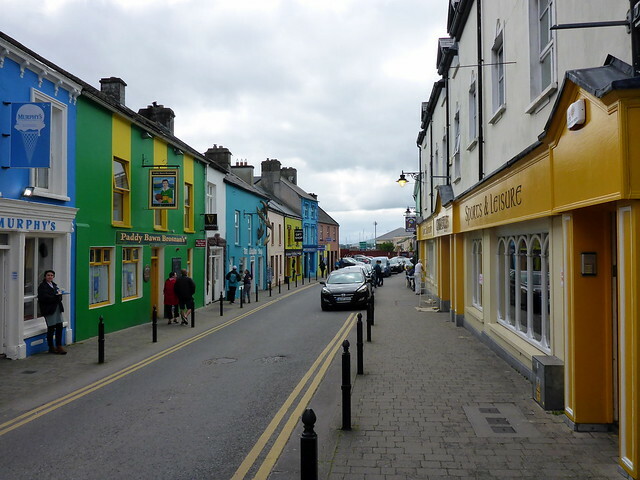 Getting there looked easy enough - until we drove through Mallow and co-incided with a 3 day Garden Festival Event. Let's just say an hour to drive about 5 miles through Mallow made me swear never to return there. 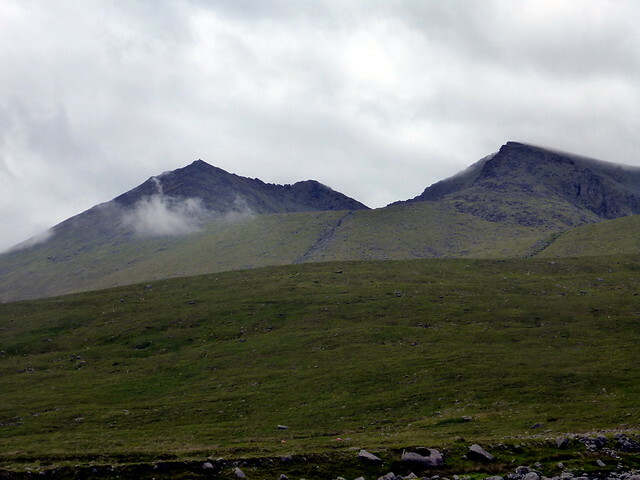 Soon we could see the Reeks rising up in the distance - a little like the Cuillin, impressive and foreboding. 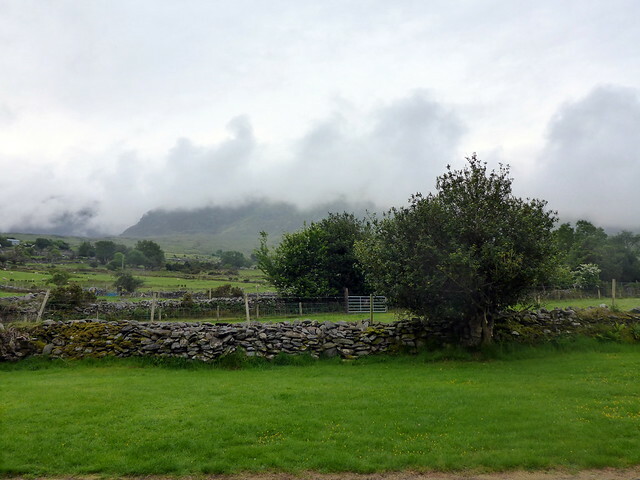 Eventually reached the Ring of Kerry road where the googlemap instructions let us down and took us into the Gap of Dunloe - a very narrow road that was also very busy. 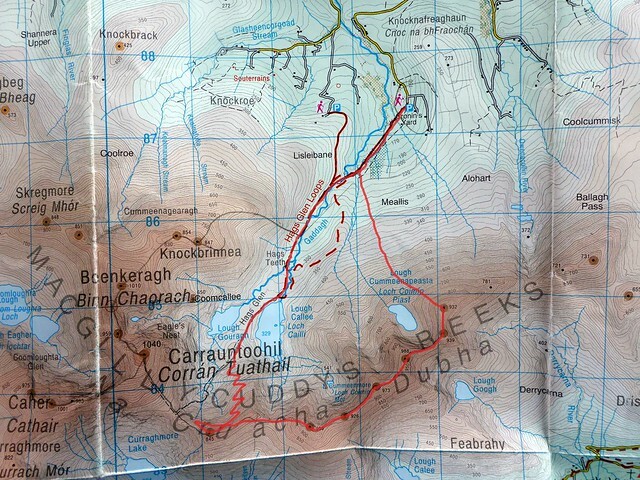 Managed to get turned and corrected the mistake, following signs for Carrauntoohil then Cronin's yard. 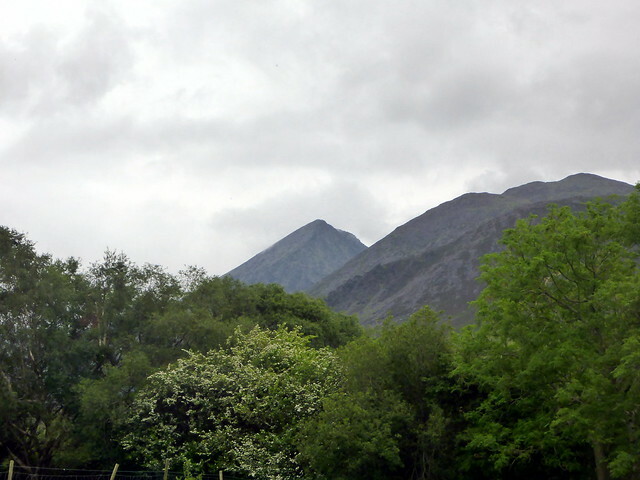 This is a parkign area for the Reeks that has a cafe and an area for tents with a couple of hobbit huts available. Facilities are quite basic, but at 5 Euro per night a real bargain. very friendly place too. There was a group of Polish lads in a cluster of 4 tents and a couple of Dubliners in the hobbit hut adjacent to our pitch - we spent a while trading tales with them before getting tea fixed and having a couple of beers. 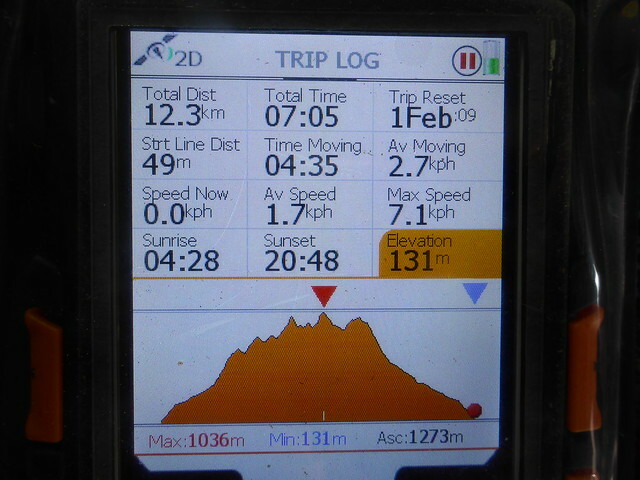 We sat looking out at the hills and weighing up what to do the next day. Forecast was reasonable for Monday, less good for Tuesday but both days were supposed to be dry. 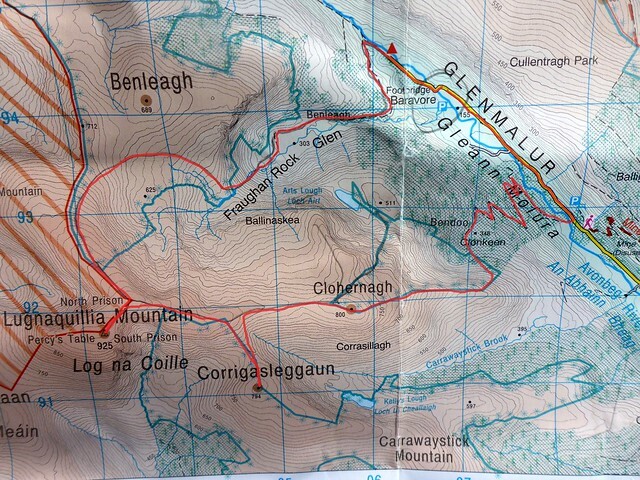 I had thought about going up the zigzags or devil's ladder, doing Carrauntoohil then out to the Cahers and back to Beenkeragh and descending off Knockbrinnea - but this wasn't the route in our guidebook and that made me a bit uneasy given recent navigational form. The book suggested the eastern 5 was a more challenging route than the western ones, so we finally decided to go for that and leave the 5 westerners for tuesday. I didn't sleep very well worrying about the day ahead. Woke with a sense of foreboding. 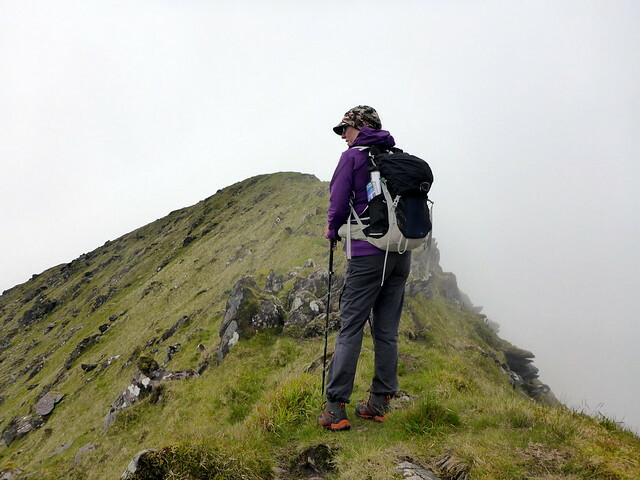 Not so much that anything bad was going to happen on the hills, just fear that I wouldn't be able to manage the circuit and my hopes of completing the Furths would be dashed. 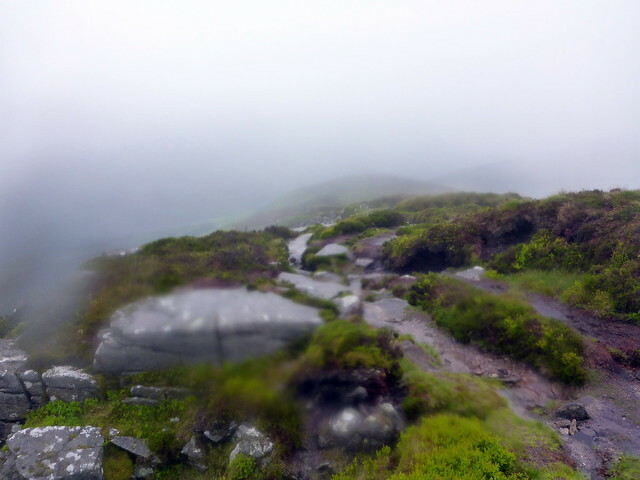 Clag was right down - around 200m which didn't help my spirits any either. 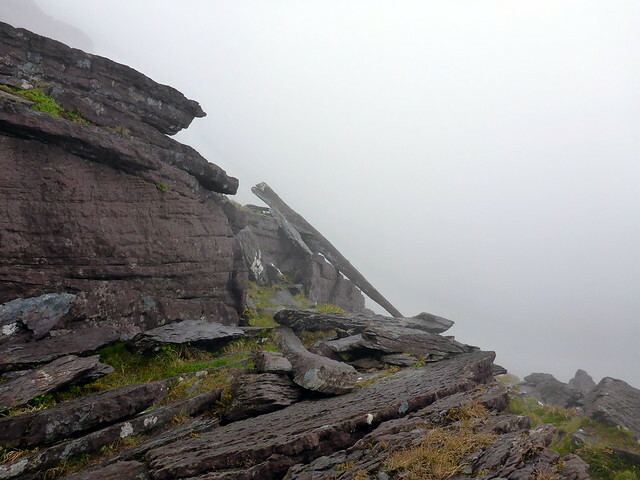 Re-read the guidebook description - the narrow section at Big Gun was apparently the trickiest in the Reeks. We took the path out of Cronin's Yard and turned up left at the first bridge - note - the guidebook was written before this bridge was installed, so you should continue on a little to the second bridge and turn left there...anyway we were aiming for Loughcumeenapeasta (which we couldn't see) and indeed went a bit too far east. 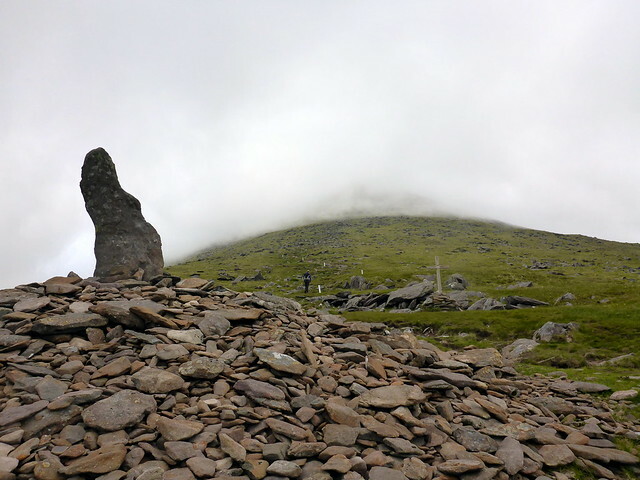 It didn't really matter, Cruach Mhor is stony all around and we did meet up with a path as we got near the top. 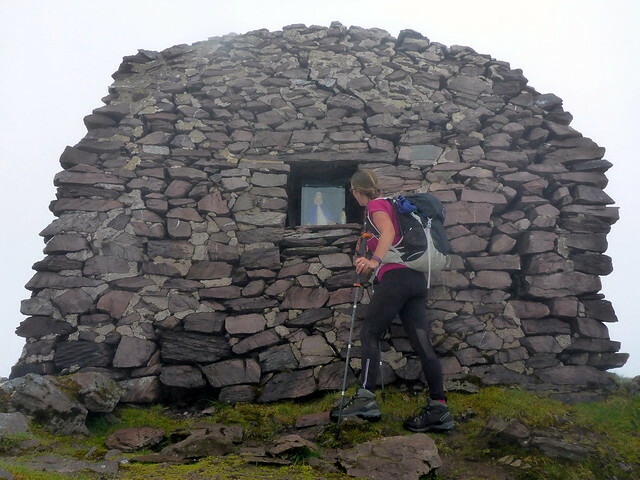 The summit is decorated with a large grotto constructed single-handedly by Tommy Sullivan in the 1970s - complete with statuettes of Our Lady etc. 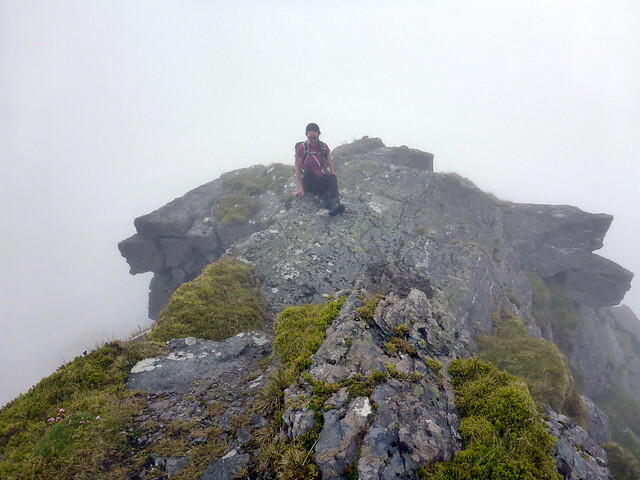 Well that's a first for a mountain summit. 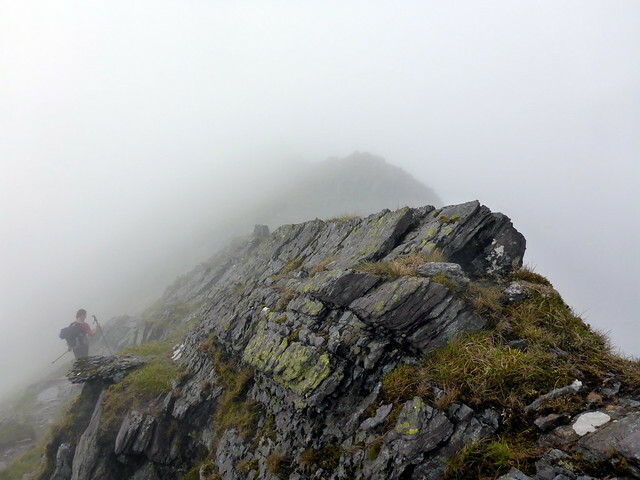 our instructions were to head around to the back of the grotto and follow a path along to Big Gun, keeping to the right of the crest, which is blocked by several gendarmes and which we didn't fancy scrambling over in the clag and wet. Stopping regularly to check our bearings we made it to the rock slab that needs to be climbed shortly before the summit of Big Gun - a skoosh in dry conditions, a little challenging today but no real exposure. 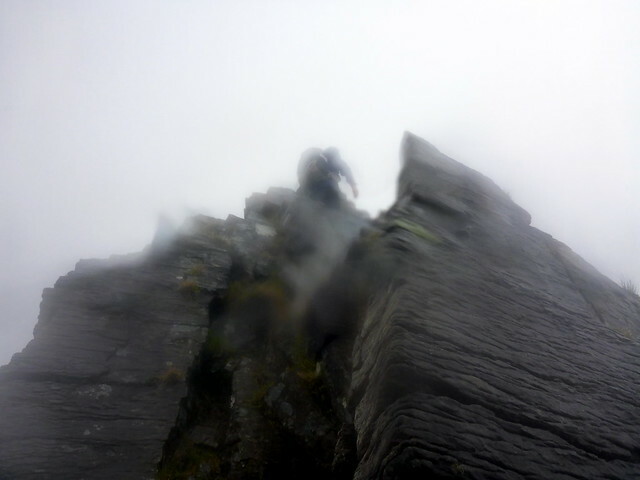 Then a short scramble to the airy top of Big Gun. 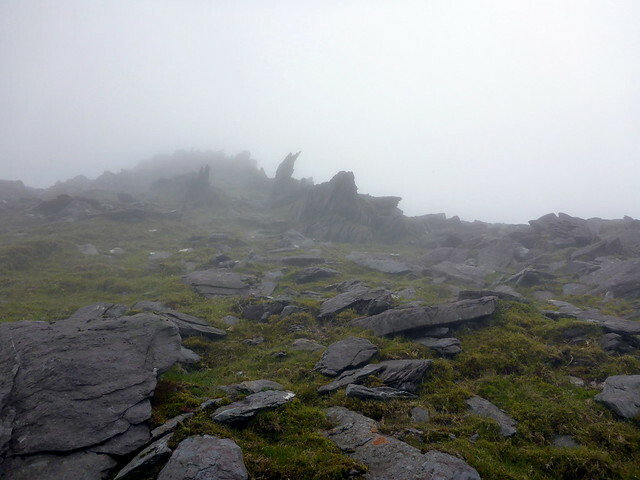 There's a slab to be crossed next which is exposed - we bum-shuffled it given the wet rock and started to head for summit three - Cnoc na Peiste (hill of the serpent). Main instruction here was to keep to the left hand side of the crest and there were no real problems. We came to a col and had lunch. 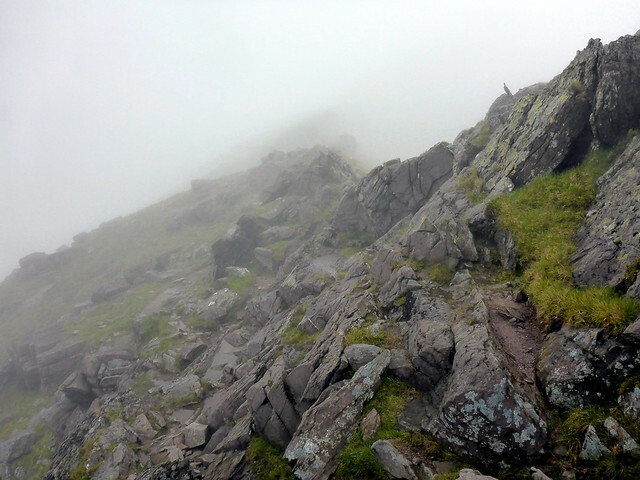 From here we followed a path on the left of the crest with instructions to climb steeply up near the summit. 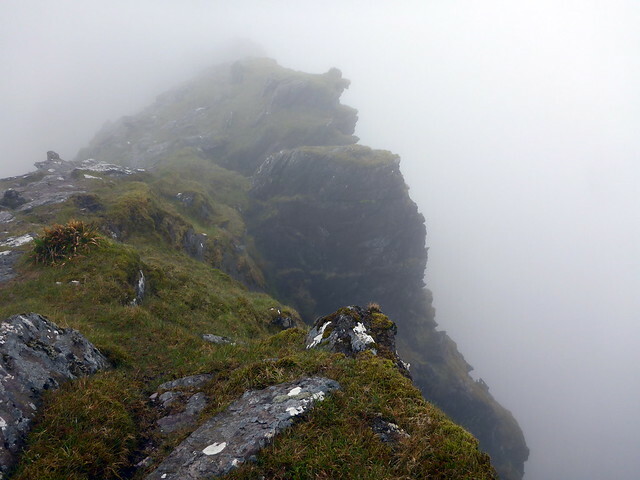 We took a faint path that rose up too early and found ourselves facing a very sharp ridge crest with a scary looking path on the right of the crest. We descended the way we'd come up and found the proper path ascending to the summit a little further along. 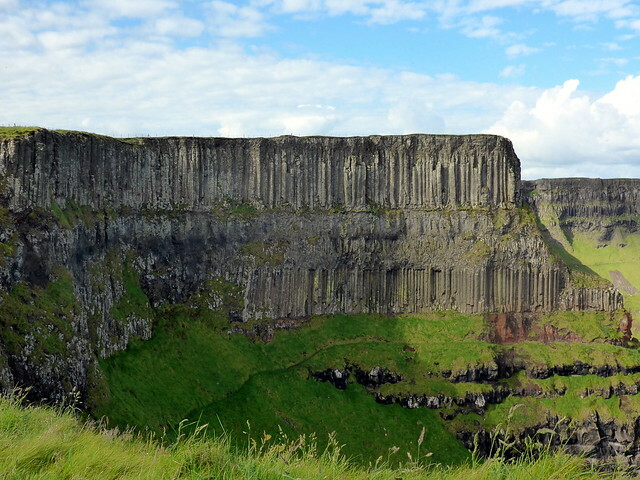 Here we met 3 British folk who were speculating whether to continue on the way we'd come. 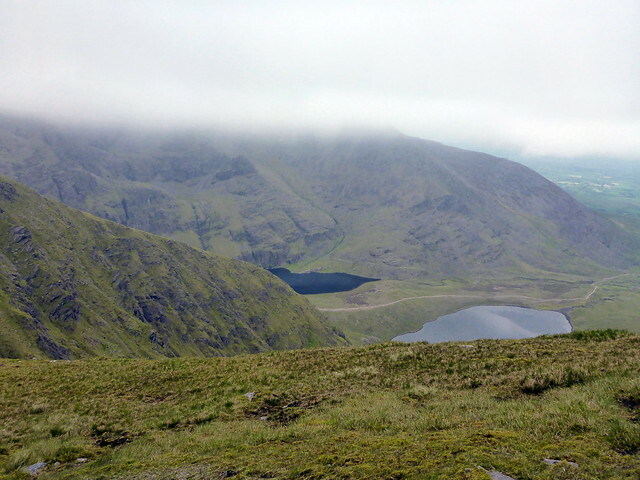 They did have a Harvey's map of the reeks which would have been helpful - I took some photos for reference. From here on the going became easy. Grassy slopes to Maolan Bui lots of sheep. 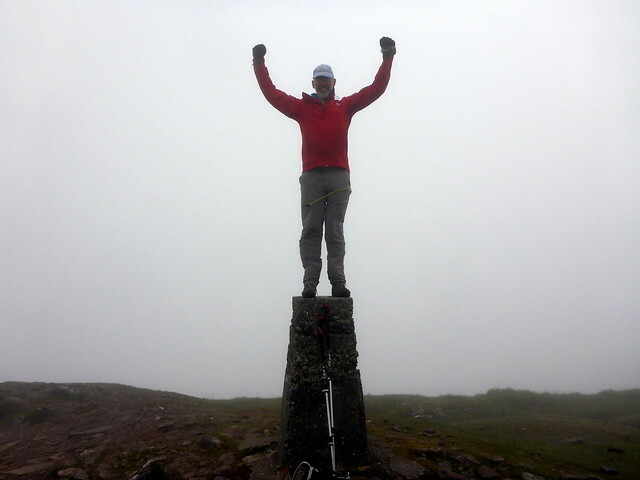 Then over a minor top (926) and the last Furth of the day, Cnoc an Chuillin. 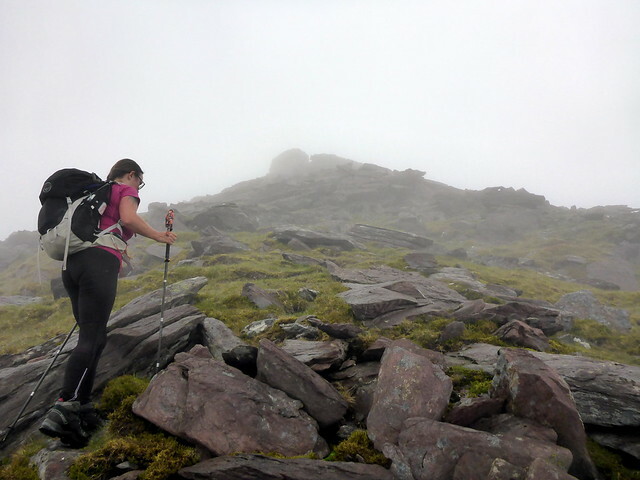 Our route told us to head for the start of the zigzags, just before the summit of Cnoc na Toinne (845m). Unfortunately we missed the beginning of the zigzags and found ourselves on a bypass path heading for the Devil's Ladder. 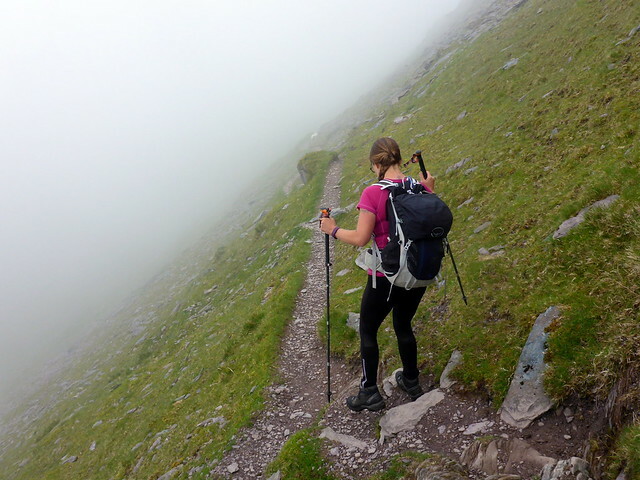 The book suggested not descending by theis route - although from what we could see later on it appeared to be a fair enough scree run with nothing particularly tricky. 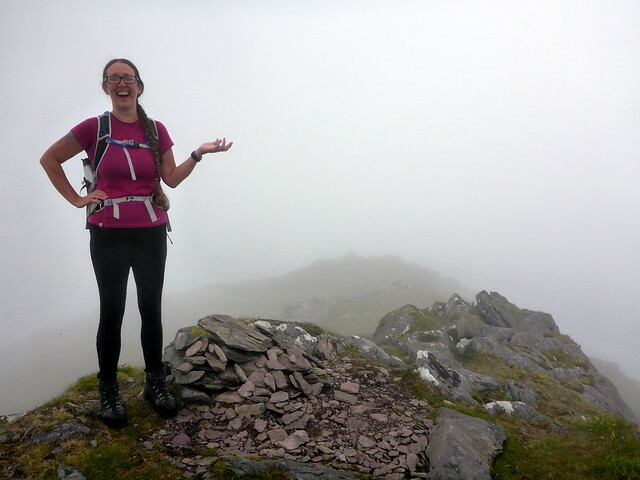 Anyway, being good boy/girl we turned arounsd, summited Cnoc na Toinne and found the pile of rocks marking the start of the zigzags easily enough. 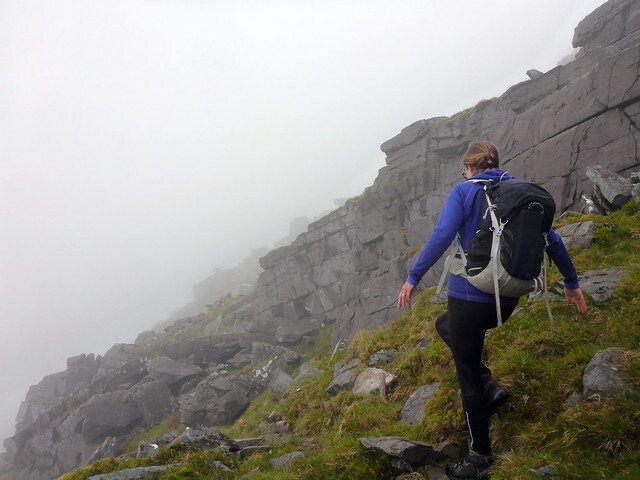 There followed a pleasant descent into Hags Glen, between Loughs Gouragh and Callee and back to Cronin's Yard. 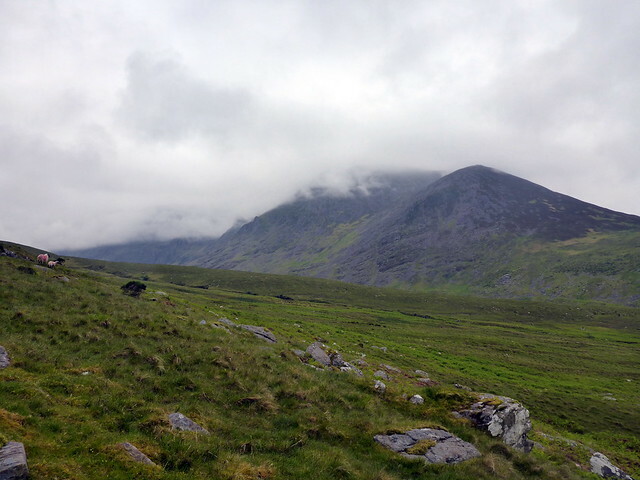 The clag lifted and we glimpsed the ridge on Cruach Mhor as well as the foreboding flanks of Carrauntoohil. 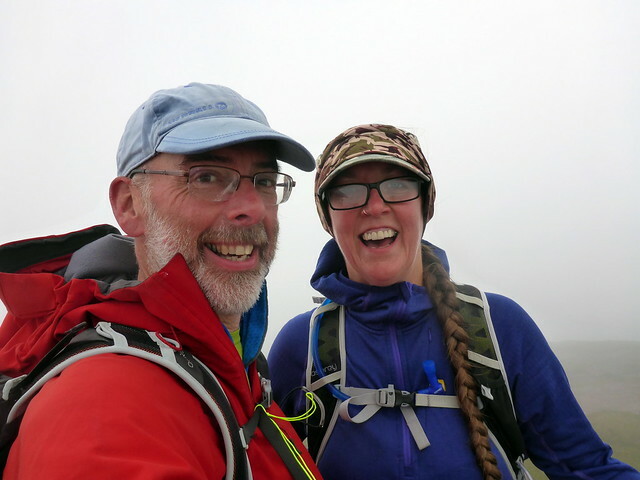 It had taken us 8 hours - largely due to the conditions and the faffing about with navigation, but there was a sense of achievement. Now only The Bones stood in the way of achieving the Furths - that would be tomorrow's challenge. Had a fry up for tea and bed early. 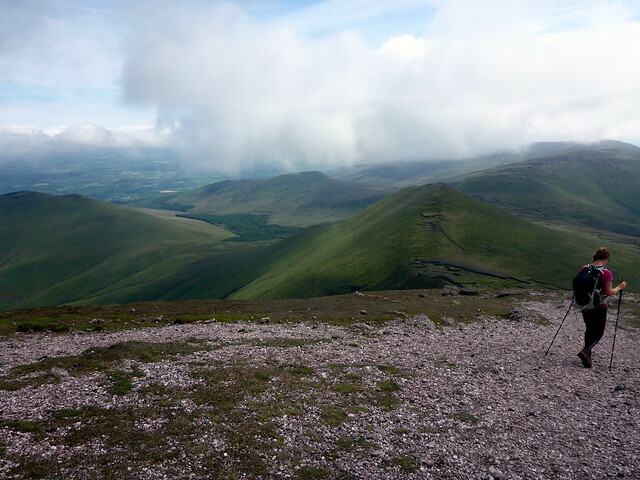 Up at 7 - sat having breakfast in sunshine then the rain started and the clag came down. 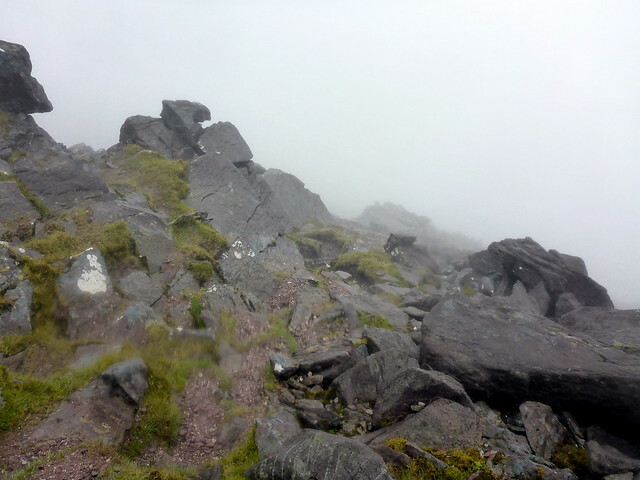 Really dispirited - after yesterday's clambering about in clag I had hoped for dry rock and views. 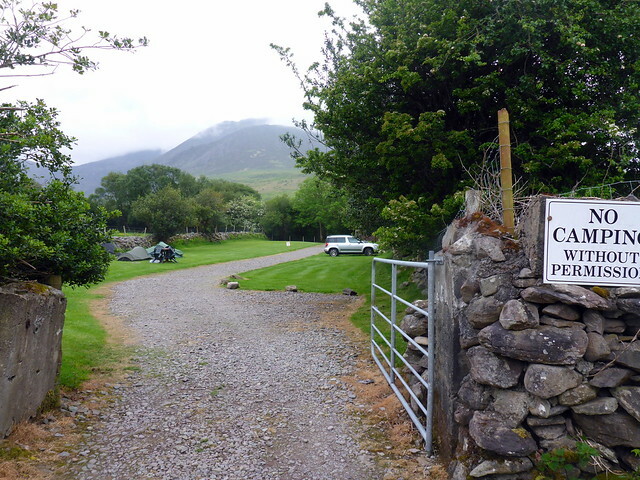 We packed up the tent and drove round to the start of the Hydro Track, maybe 10 miles to the west from Cronin's Yard. No-one else in the car park Waterproofs on at the outset - there were times when it looked like drying up but they came to naught. 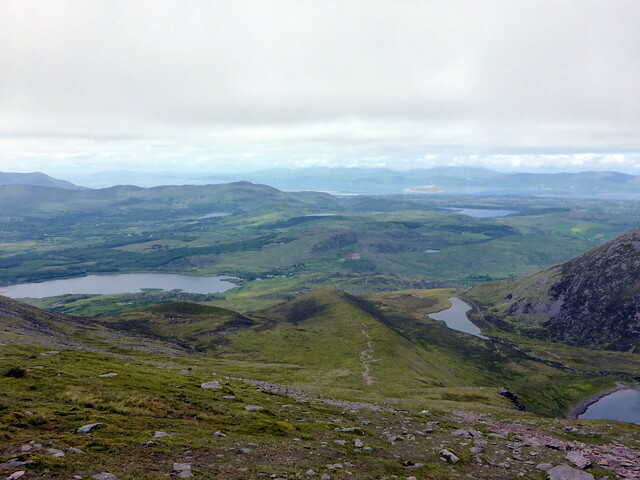 We walked up the concrete hyrdo track til we reached the west shores of Lough Eighter, which we could faintly see. 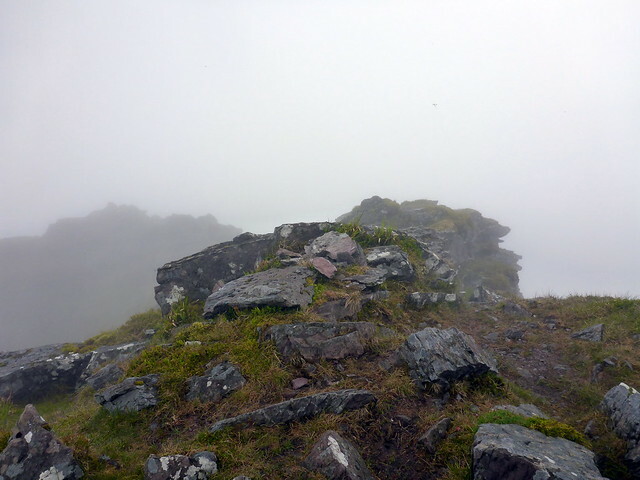 A "majestic natural amphitheatre" was how the book described the view - well not today. 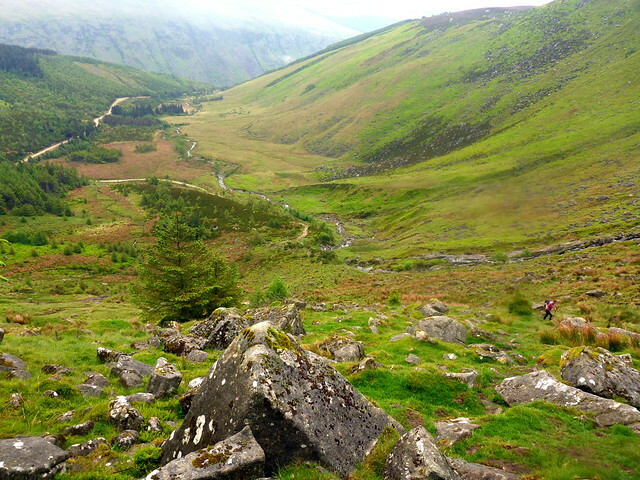 We crossed the dam to our left and started up Breanlee - following a faint path through heather, then becoming increasingly rocky as we neared the top. All I can think of is "can I manage the Bones?" 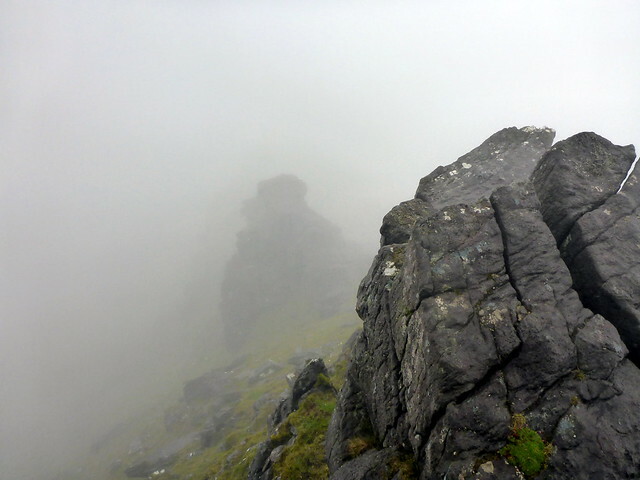 We continue on to the tops of Scrieg Mhor & Beg before coming to the pull up onto Binn Caorach (hill of sheep). 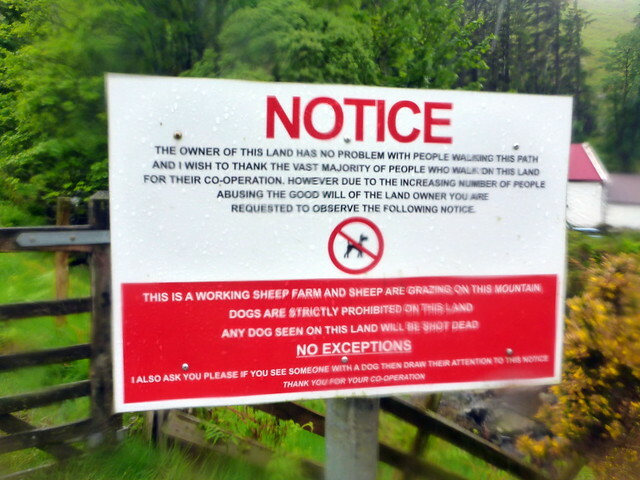 Indeed there were sheep around. The path pick a way through boulders and we were standing at the summit. I had little idea of what came next. 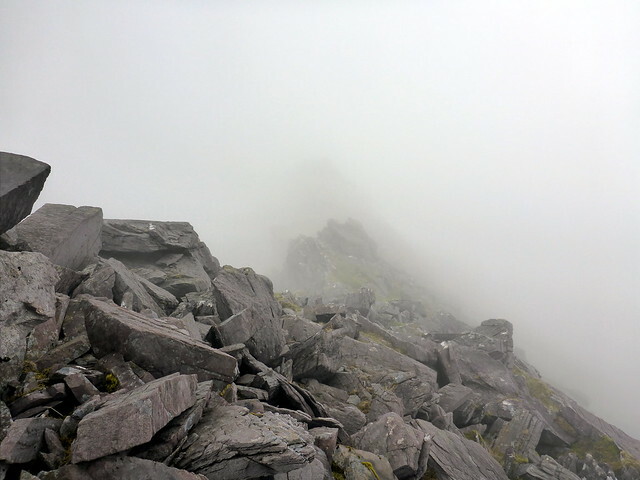 The book mentions an arete that can be crested, but in any case you come off the summit SW (bearing 234 degrees) where there is a path to follow. 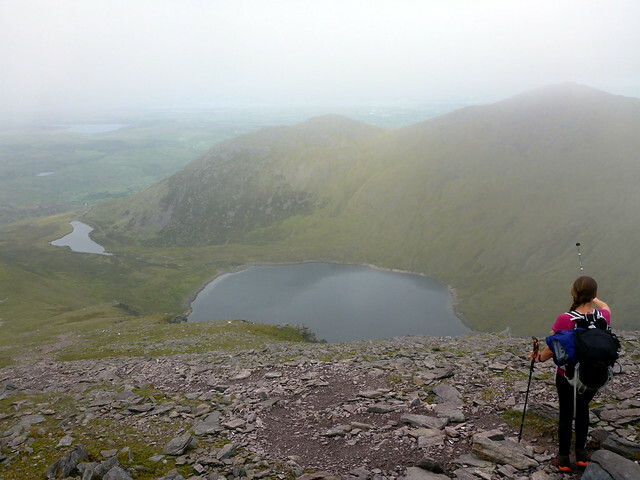 I'm unsure if the arete is to our left - although in hindsight I realised the arete is still to come and is the section with Na Cnamha on it. But more of that shortly. 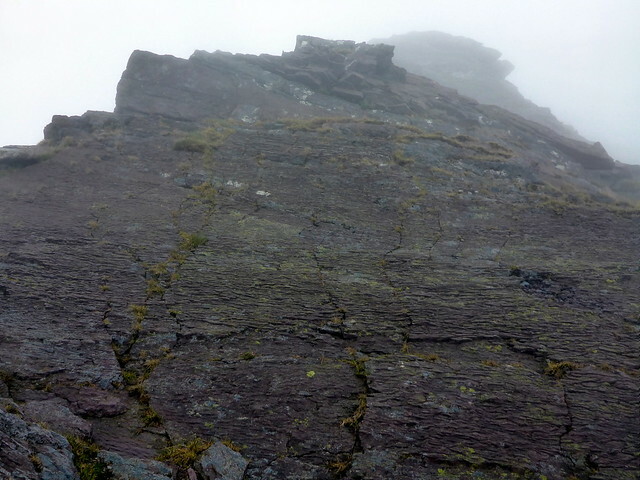 We come to a split rock pictured in the book at the beginning of the arete. 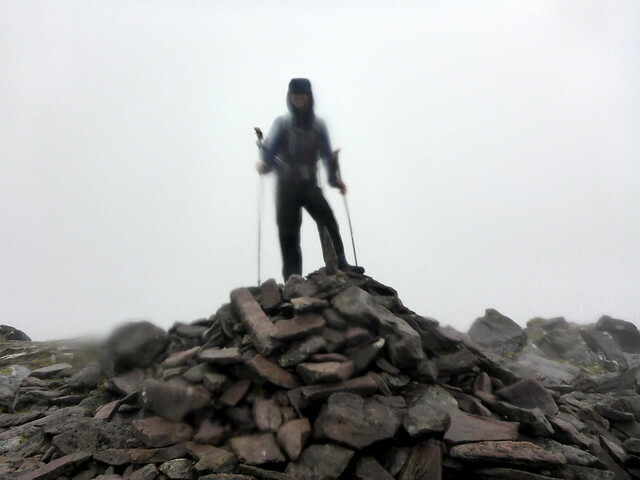 We decide to stick to the crest for a bit, which is ok, no sense of exposure due to the clag, which was a small consolation. 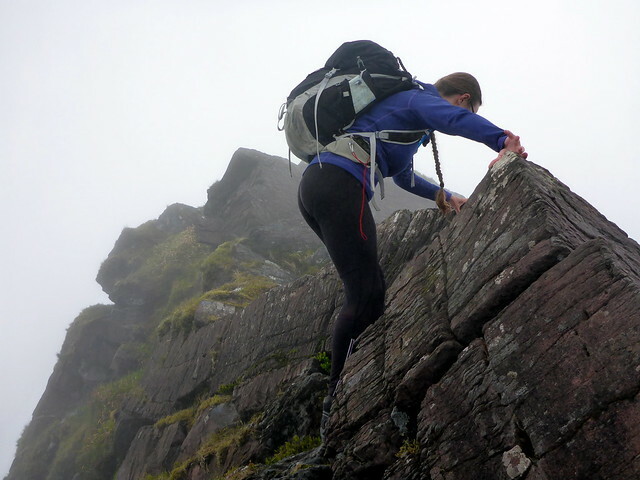 We reach a notch as described in the book and now have to climb up onto the ridge to get the Bones top - the first pinnacle with a small cairn on it was too easy to be the summit and we continue over the next 2 pinnacles, taking care to reach the highest point. Whew - not too tricky actually. From here we should have probably just continued over the remaining section of arete but decided to follow the book and re-traced our steps down to the notch and taking a path on the left of the crest. 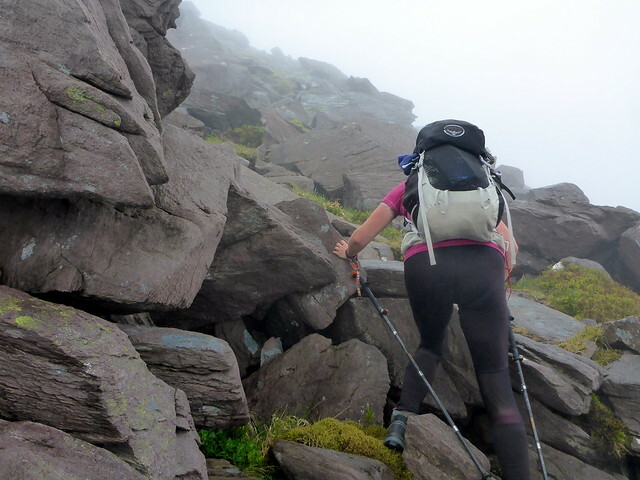 This had serious exposure issues, descending very steeply into O'Shea's Gully but didn't last for long and soon we were at the col at the top of O'Shea's gully, ready to start an ascent of Carrauntoohil, Ireland's highest peak. We had lunch first, with a very talkative raven keeping us company. 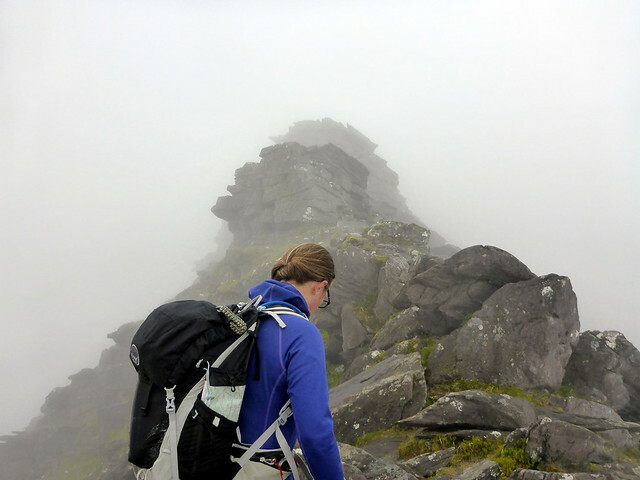 Allison chose a scramblier route than following the main drag, passing over the openings of two other steeper gullies. 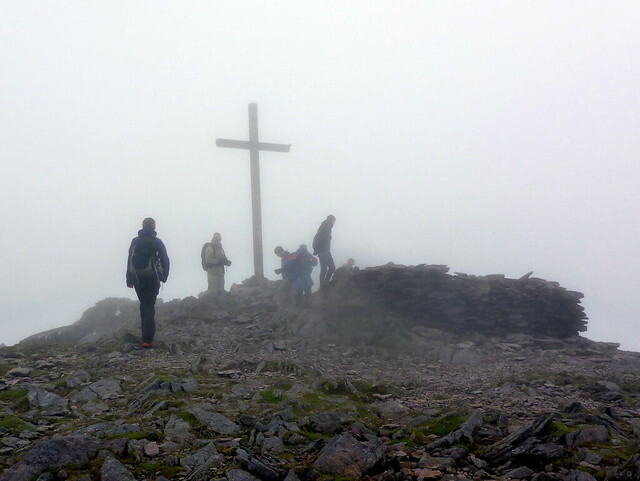 At the summit were a number of folk and a huge wooden cross. We met an American who had "just sorta clawed my way up from the south side" and who seemed to have little idea of which way he was going down. 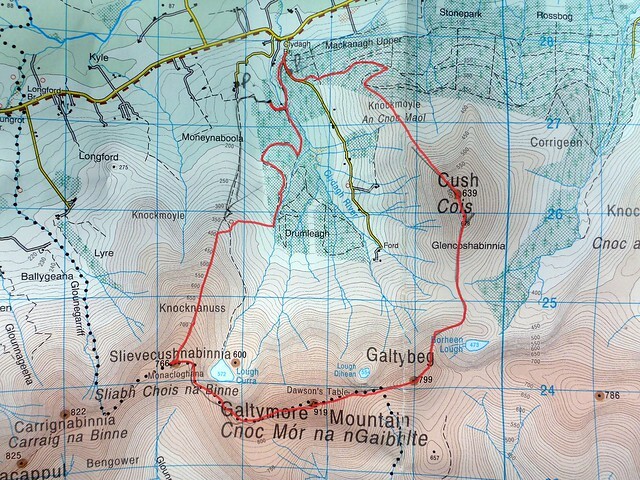 Our route was to go over the remaining two peaks of Caher & Caher West top. 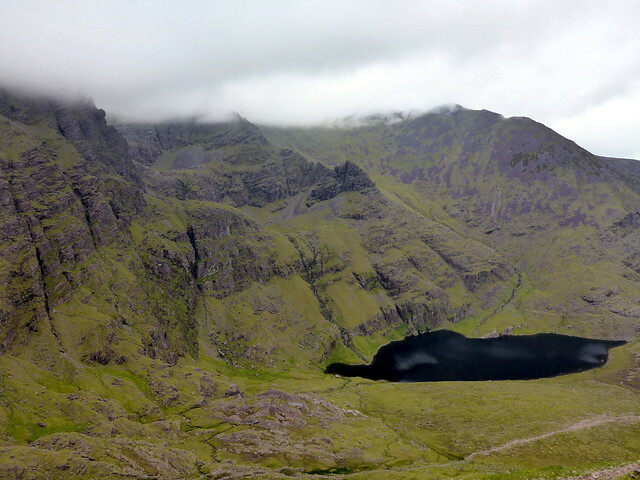 I had imagined these as rolling grassy slopes, but actually there's an interesting ridge joining them to Carrauntoohil which again was spoiled by clag. Lots of sheep enjoying the rain. From the Wop it was a steady descent back to the start point - once again the clag lifted as we descended - someone is definately having a laugh at our expense. 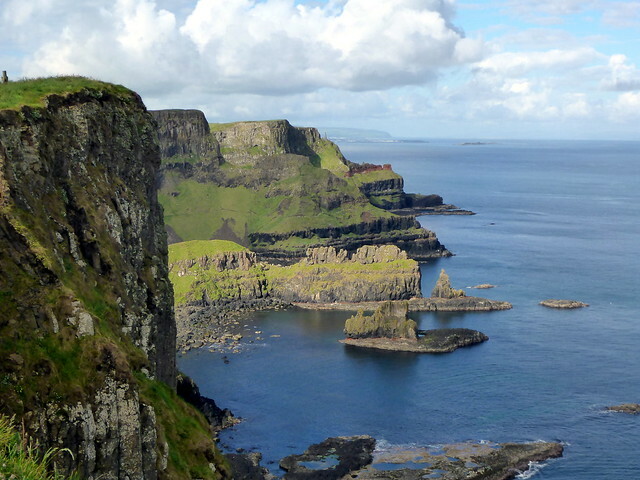 We could see the "siamese loughs" of Coomloughra and Lough Eagher and away in the distance the sandy beaches of the Dingle peninsula - the sun was shining over there!. 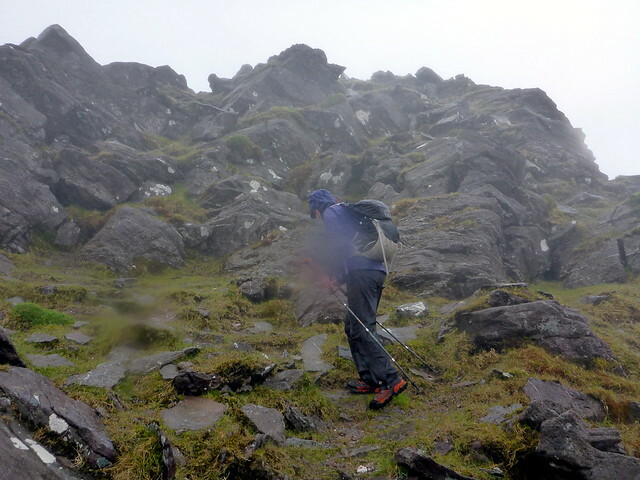 A boggy section to negotiate just before reaching Lough Eighter then back to the car. 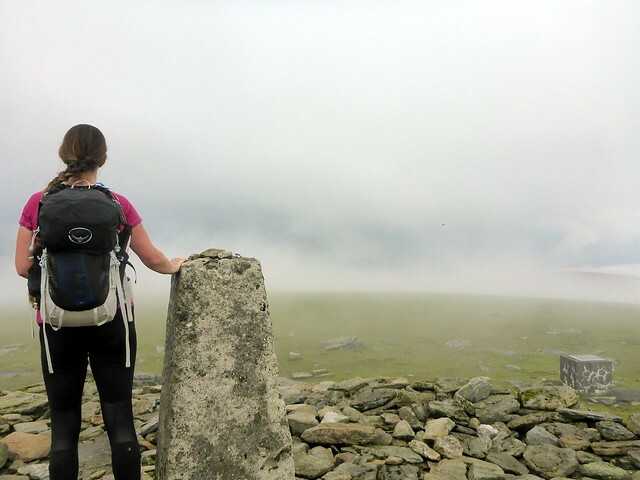 A feeling of some relief that the Reeks had been completed - these are proper mountains and I'd liove to have had a better selection of weather to enjoy them in. 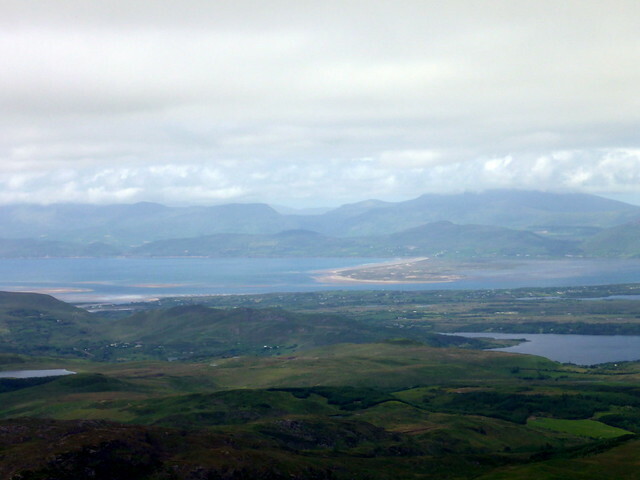 From here it was a shortish drive to Dingle - via Kilorglin and Milltown. 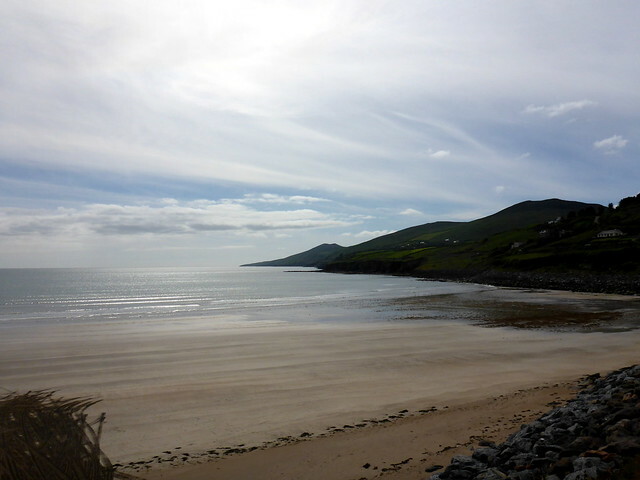 Lovely stretches of sand at Inch Shore, Dingle a bustling pretty town. 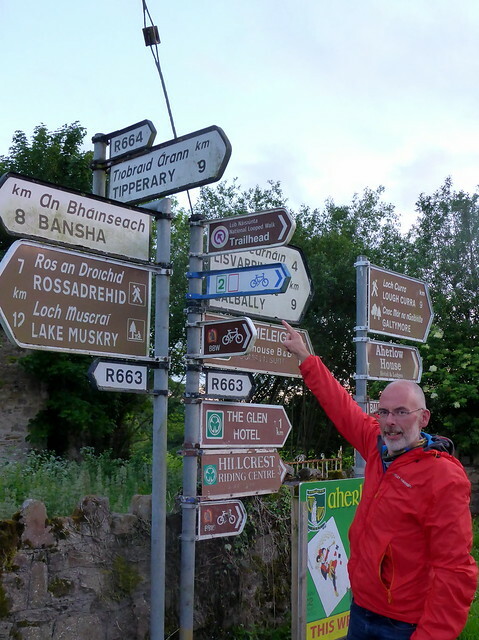 On the OSi map for this area everything is in Gaelic with no English translation. 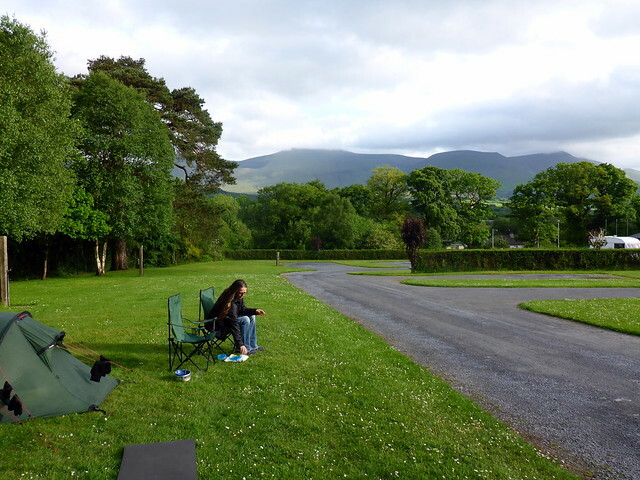 We drove round to the campsite at Gallarus - the most westernly campsite in Europe - and pitched up in the sunshine. 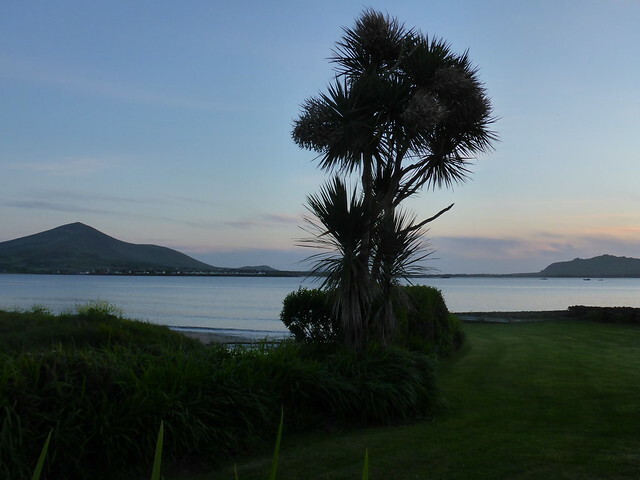 in the evening a stroll along the seafront to BallyDavid/Baile nGall for a lovely Guinness at Tigh TPs overlooking the sea. 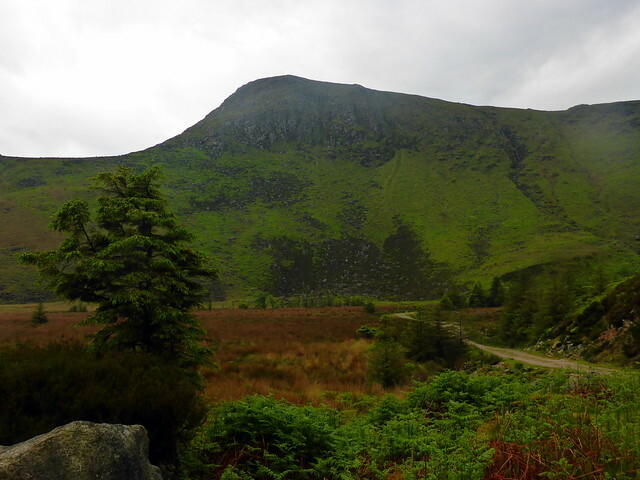 We could see Brandon Mountain up to the north as we walked there and reckoned we'd chosen a good hill to finish on. 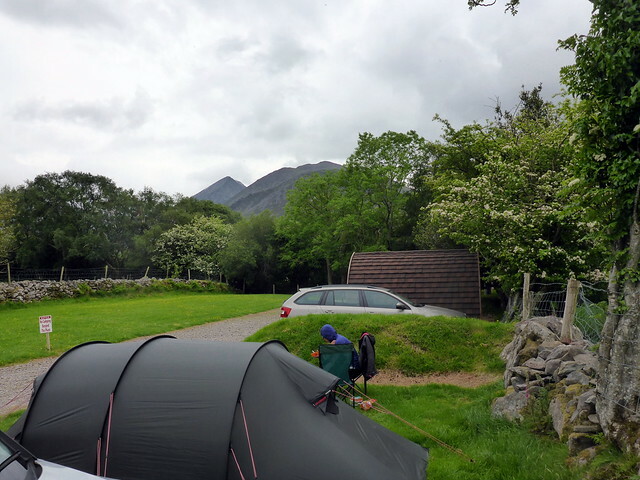 A dry morning - birdsong from first light as we lay in the tent preparing for a relaxed final day of climbing. Set off to drive the 10 miles or so to the car parking area at the start of the Pilgrimage track up Brandon - I had considered doing the Faha Ridge from Cloghere but our campsite location made the westernly approach more sensible and we could still walk the ridge south from the summit, albeit at the cost of an 8km path/road walk back to the car. 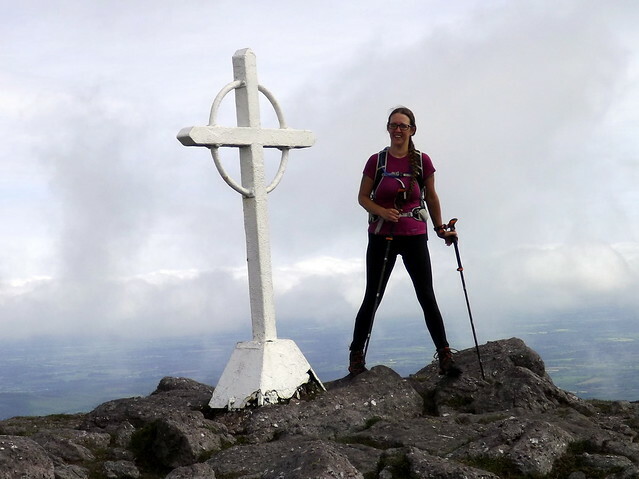 cloud was sitting on the summit as we arrived at the cul-de-sac with its statue and dedications - there are Stations of the Cross each with a numbered cross set on a cairn that you pass ascending the mountain and the way is marked with white markers every 50metres, so difficult to lose your way here. 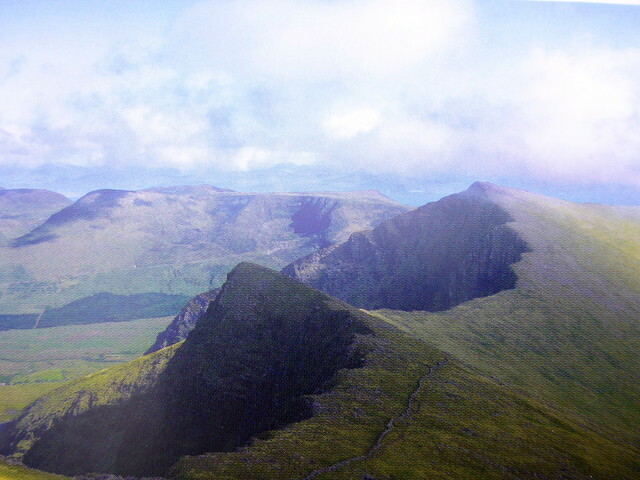 Actually the mountain as a site of pilgrimage/ritual predates Christianity, with the summit being used for the Harvest festival of Lughnasadh, the last point from which the setting sun would be visible from and the Christians, as in so many other places, merely re-branding the sacred place for their own purposes. 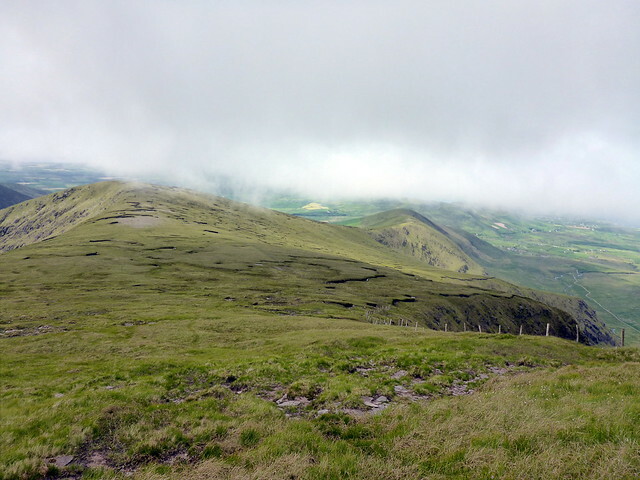 We set off - sheep and grassy slopes initially, becoming stonier as we ascended. 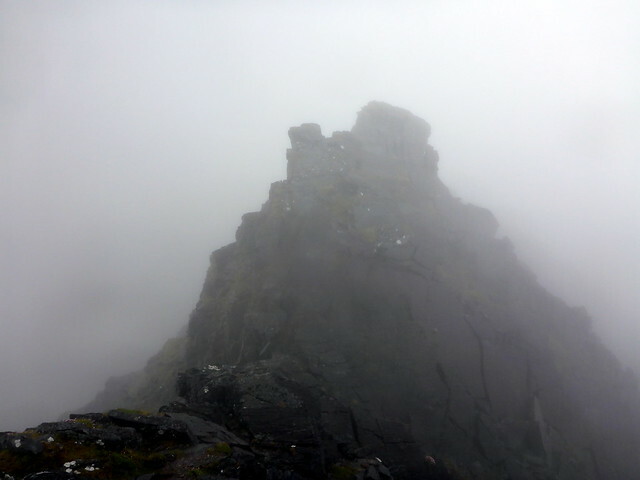 Clag began at around 600m and it was apparent that once again we'd be deprived of a clear summit. 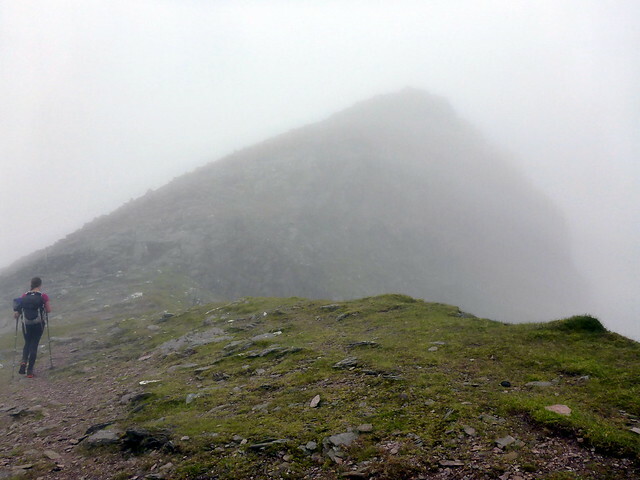 No matter - this was the final hill in my 5 year plan and i was going to enjoy it whatever the weather. 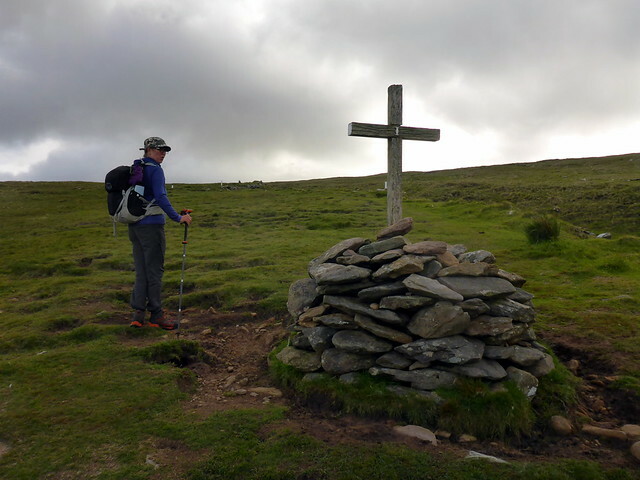 passing the 14th and final station and onto the summit, marked with a huge wooden cross, trig point and cairn mound. There are also the remains of some sort of building. 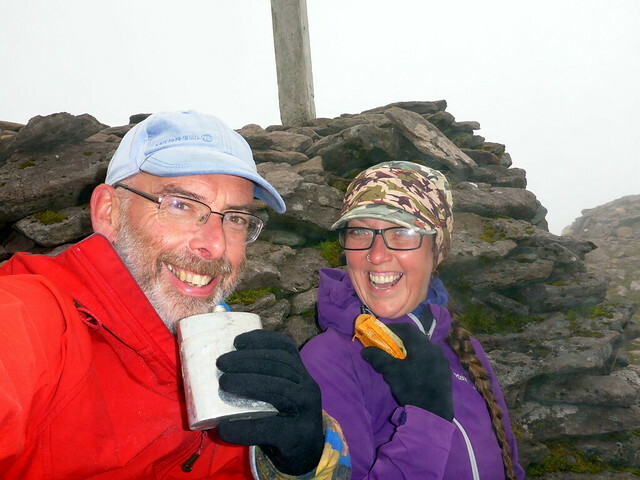 I ascended the trig point for a celebratory photo then we had some "holy water" of our own and a bit of cake. 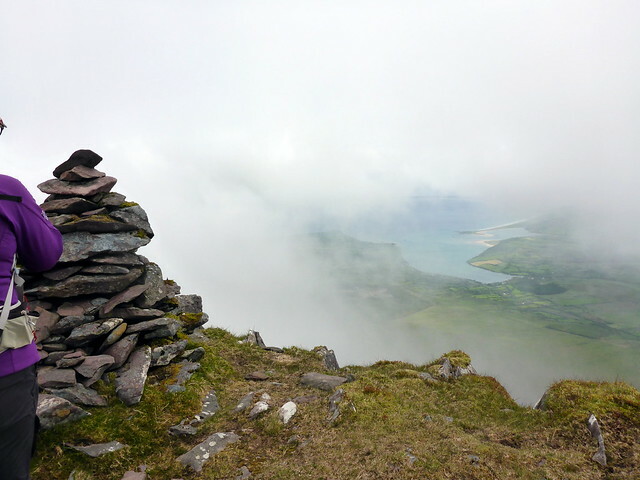 The views are supposed to be spectacular (familiar story) but once again we saw the inside of a cloud. We set off along the ridge heading east then south-ish for Brandon Peak. 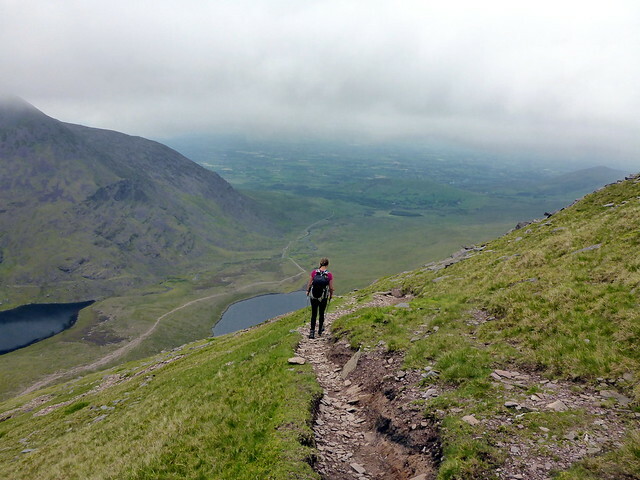 occasionally we'd glimpse the Paternoster Lakes below us, or catch a sight of beaches to the north but mostly it was clag. 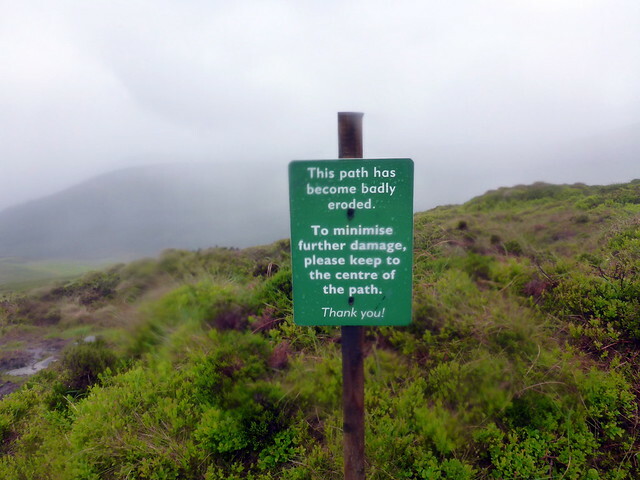 There's a good path, although it bypasses Brandon Peak and an ascent of around 150m up the grassy hillside is required. 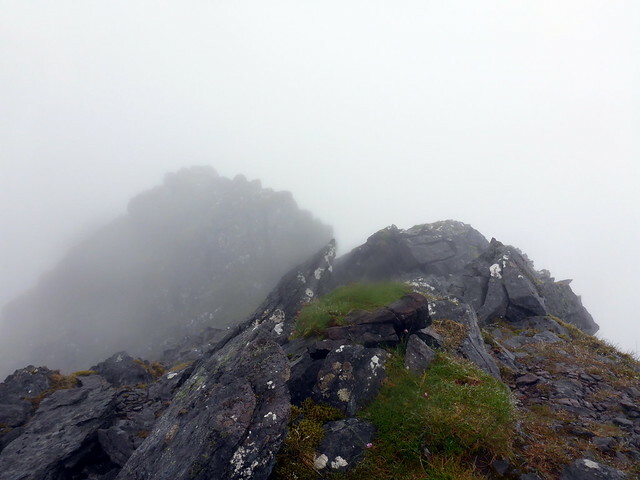 We continued along the ridge line which narrows considerably as it passes over the final peak of Gearhane. 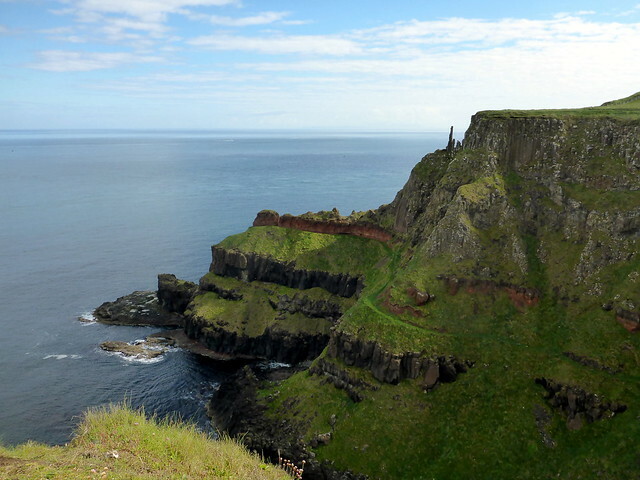 From here we could see a sensible looking way down off the western shoulder, with a track leading back to the road - however the guidebook recommended continuing to the southern flank of Gearhane and joining a track round the south - access rights perhaps. It mattered little as it was a nice day for walking. 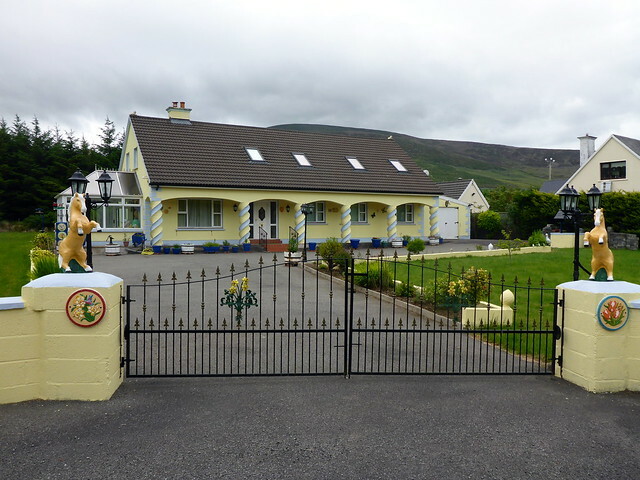 We joined the road and had the last 3 miles along tarmac, which wasn't brilliant, although we did pass a seriously bizarre house. 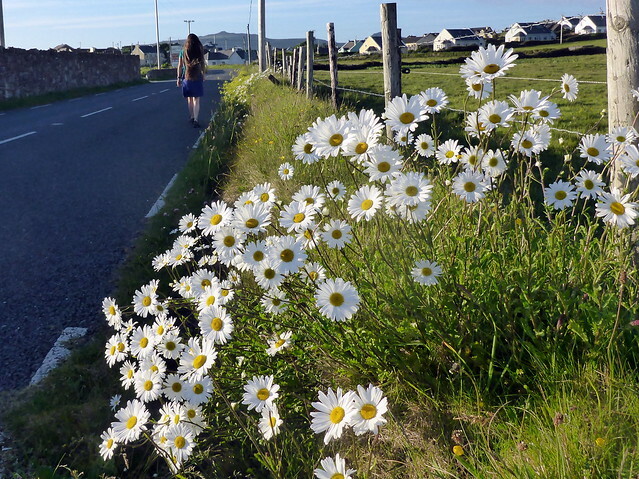 The verges were decked out with all manner of wildflowers too. 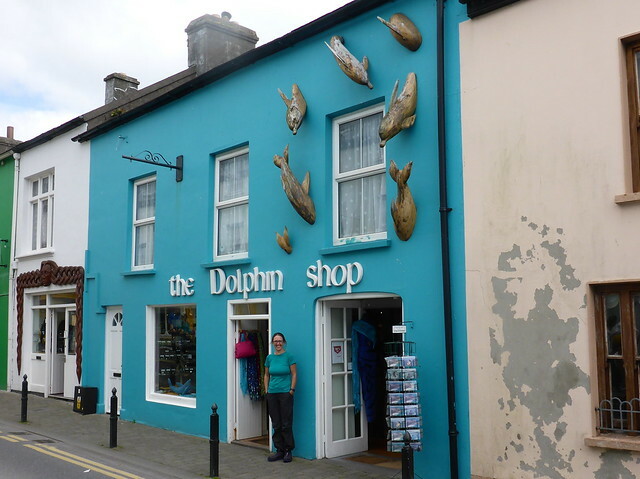 back at the car we drove into Dingle for a wee look around and to replenish supplies. Food prices were surprising - in the SupaValu store everything seemed at least twice the price back home. 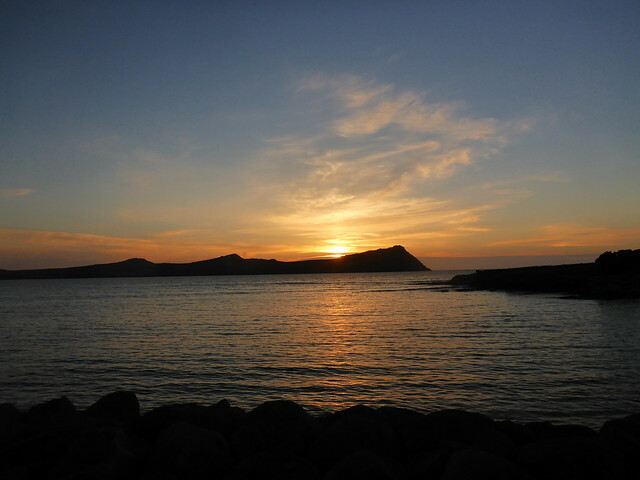 Returned to the tent, made dinner and in the evening walked back to TP Tigh's for another couple of pints. 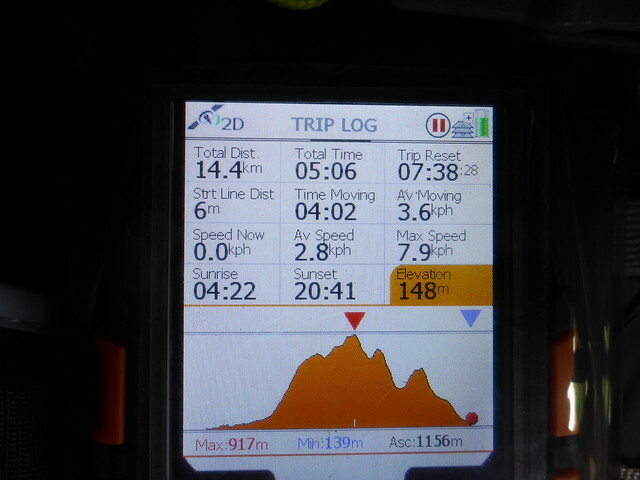 This was the "free day" in case we'd needed extra time for hills. The forecast was for rain all day, which turned out to be accurate. 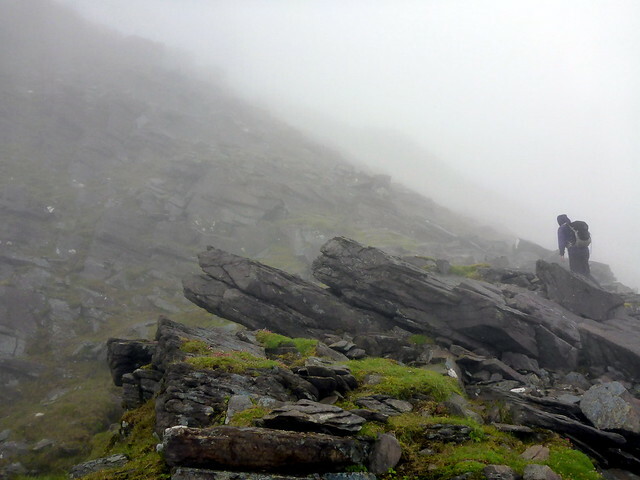 Beautiful as the Dingle Peninsula was there didn't seem much point in visiting beaches in the mist and heavy rain. 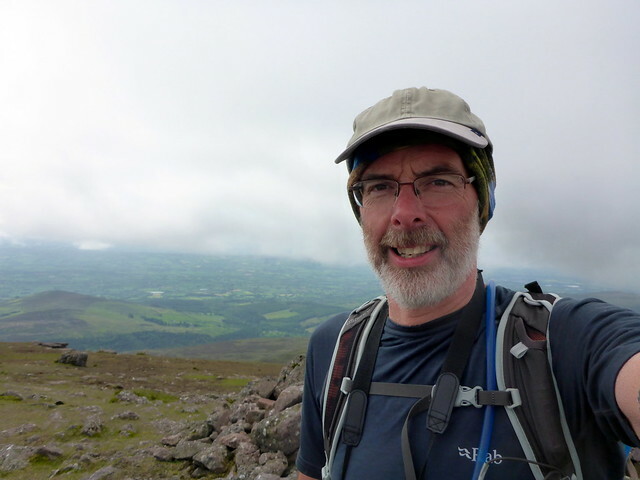 i had thought we might climb some of the other hills in the vicinity, but had little appetite for that either in the weather - facing a 400 mile drive back to Larne i decided we'd just head back that way. 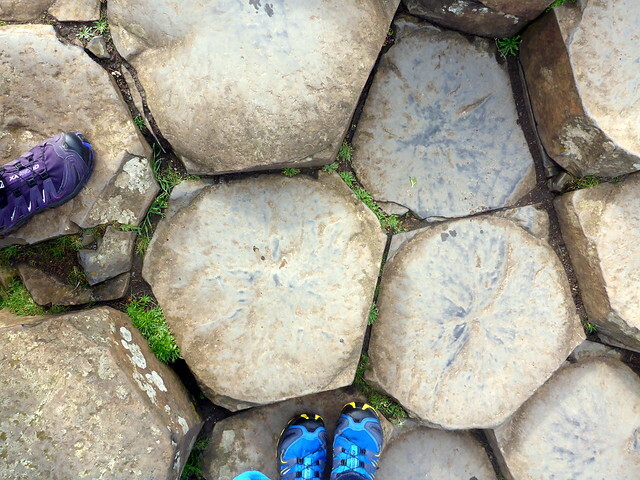 I had some interest in visiting the Giant's Causeway, though Allison had been before and thought we could head up towards that, visit it on Friday morning before returning to Larne for the boat at 4.30. So we spent the day on the road - it took 8 hours of driving, including a section on the motorway where we were held up for a whoile by an accident. 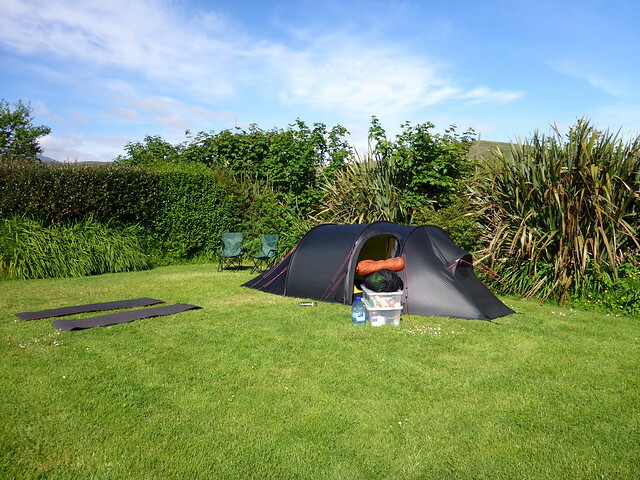 Once back in Ulster we just continued on up the Antrim coast to a small campsite (Craighouse campsite) which was close to the Causeway and conveniant for our needs. 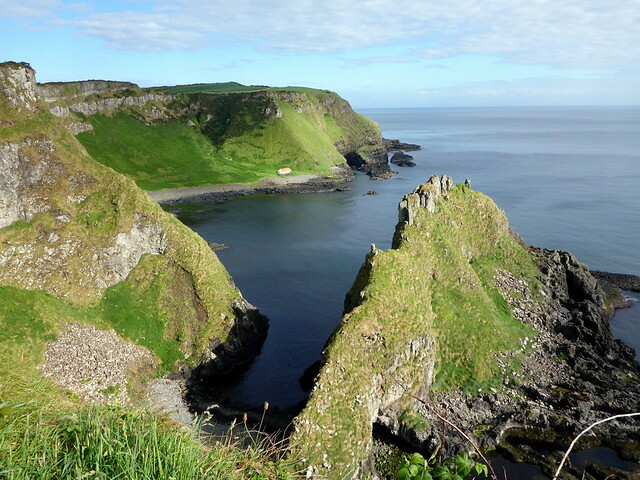 The owner suggested we take a walk over the headland to the Causeway rather than drive there - 5 miles each way. Sunshine! Typical, we could have done with that on the days we spent on the Reeks. 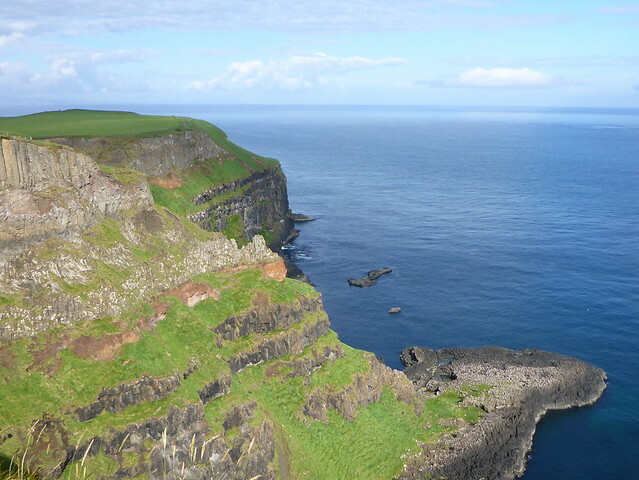 Anyway we were glad to have a chance to see the Causeway/cliffs in good weather. 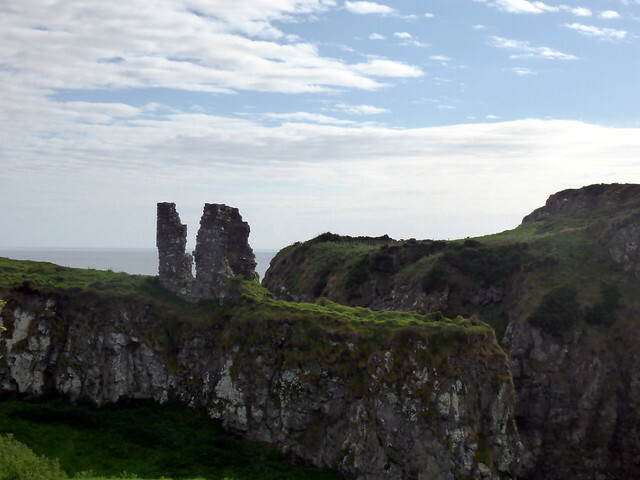 We drove a short distance from the campsite to the start of the coastal path, parked by a small ruined castle and set off around 8.20. 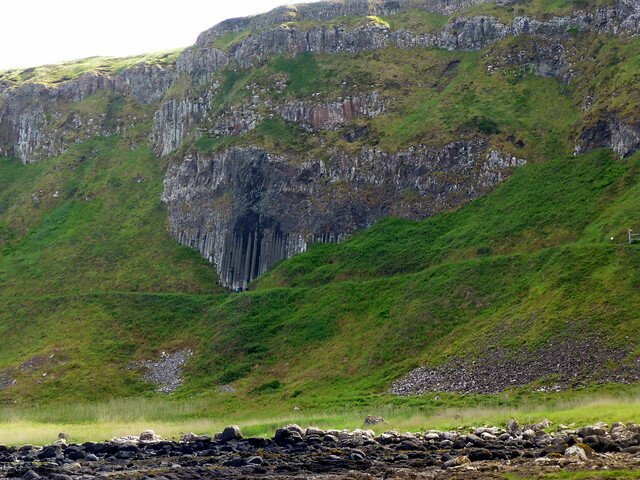 A beautiful walk, excellent views of the cliffs which contained the pillar like columns of basalt. Really quite spectacular. 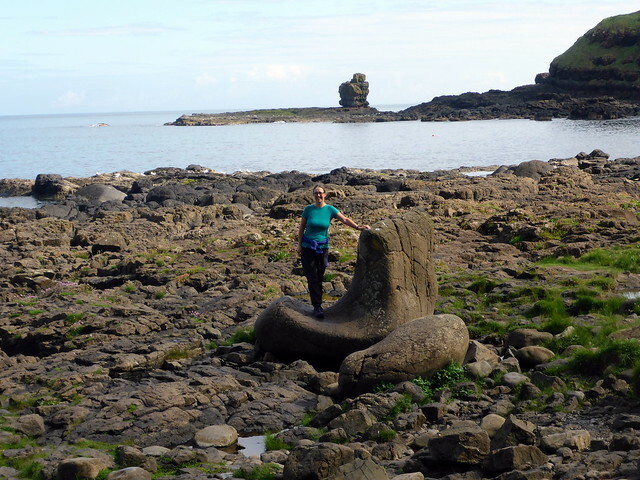 We reached the "Rock Road" down to the causeway where it started to get busy, had a wander along, got told off for climbing on the columns ("no further lads, it gets a bit loose there") saw the "boot" of Fionn mac Cumhaill (who as you'll recall built the causeway so that he could accept the challenge of the Scots giant Benandonner to have a fight, but runs away when Fionn sees how big Benandonner is and loses his boot before being dressed as a baby by his wife Oonagh to fool Benandonner into thinking Irish giants must be really big if this is a baby one). 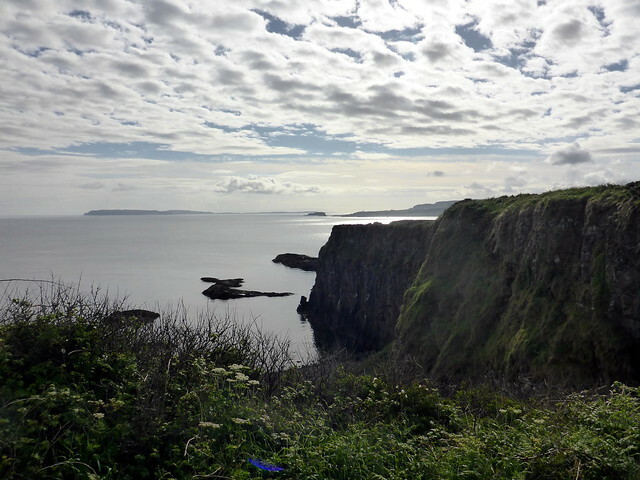 Anyway we returned by out same route - lots of folk now walking along the coastal route and returned to the car. 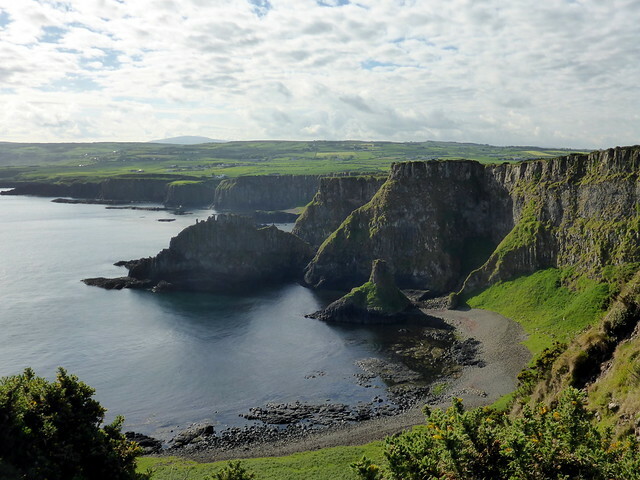 Drove along the Antrim coastal route and made the ferry with plenty of time. 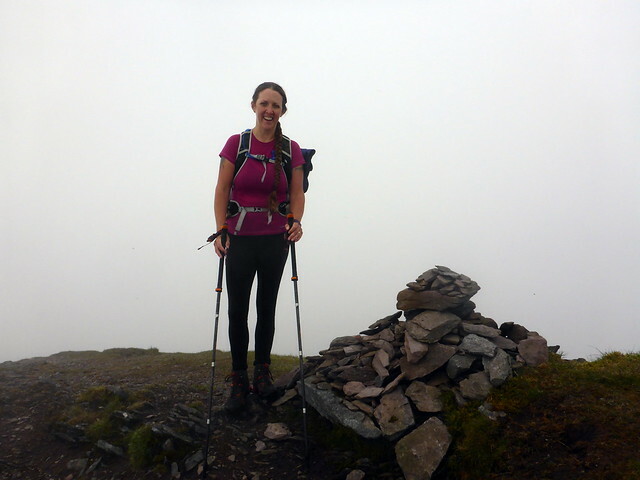 What a smashing report of your final few hills on what has been an amazing journey for you and Allison! Did you manage to find a list of Iris SIMMS before you went, just to make sure you didn't miss anything? I fancy a trip over to the SW sometime. Trying to avoid looking at Irish lists though - there's enough stuff there to last a lifetime. No i didn't have a look at that! 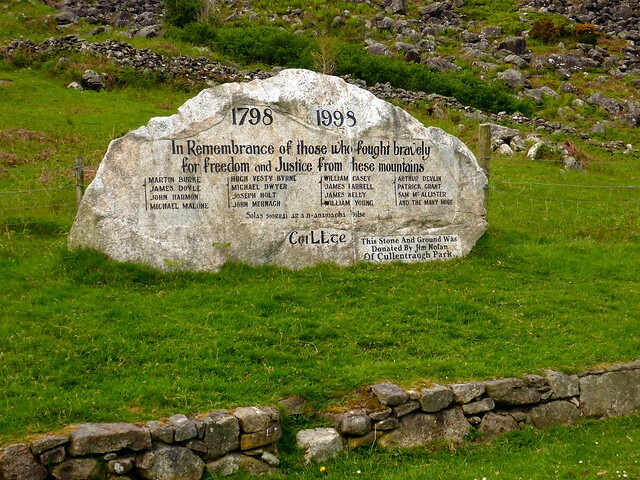 However hill-bagging does list Irish Simms, Marilyns etc. full house well done to the both of you. Fairly epic road trip to end a very epic five year plan. Nonetheless, seems you managed to enjoy yourselves as well as complete a truly impressive feat.